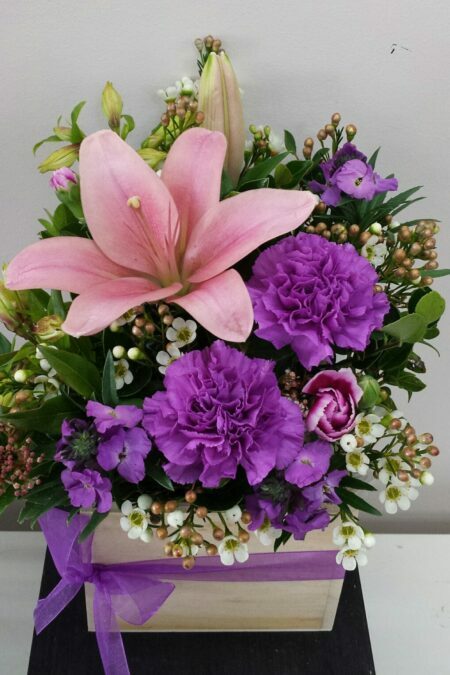 A mix of bright pink and purple flowers in a large bouquet.Ignite the passion in your loved one. Large display of long lasting natives in a ceramic pot. 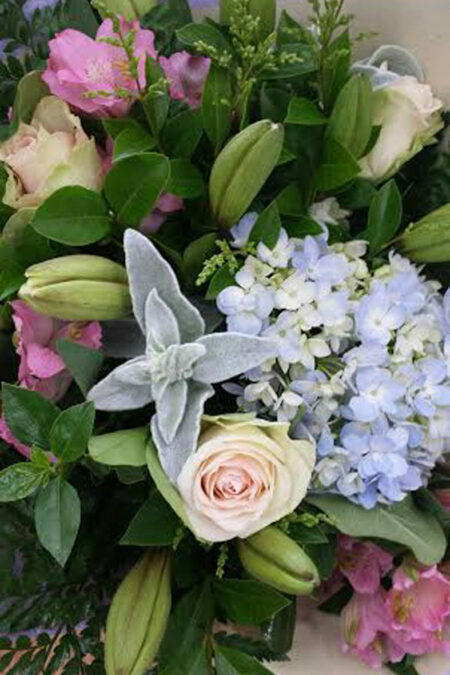 A delicate and whimsical bouquet of pastel seasonal flowers in a loose unstructured style. Why not add a glass vase to complete the look. 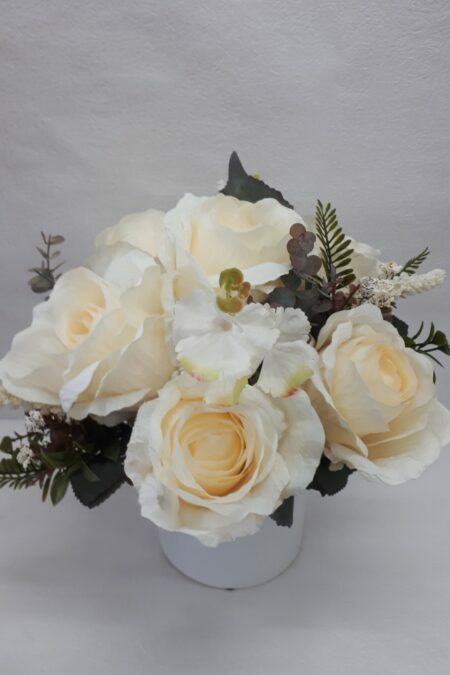 Artificial Design – Classic antique style artificial garden roses, creamy Hydrangea and blue gum foliage in a lovely ceramic pot. Bring the garden indoors with this forever design. 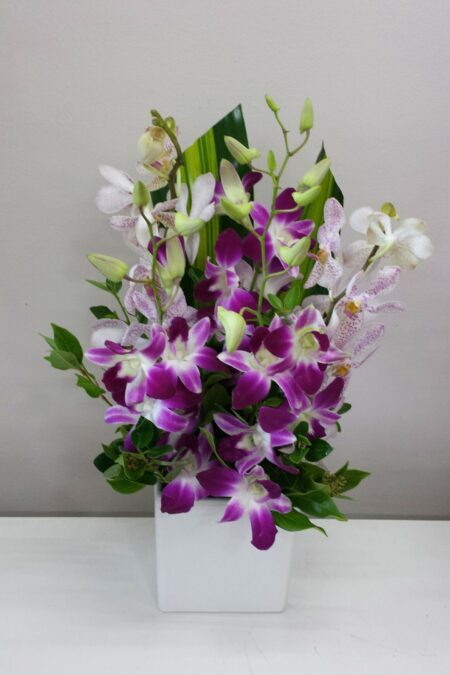 Artificial Design – Bright vibrant artificial orchids and Dahlia in a ceramic vase. Beautiful everlasting gift. 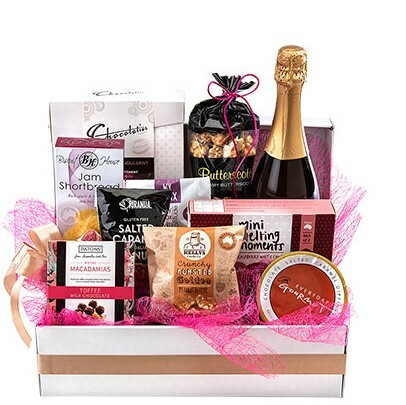 Pop open a bottle of bubbles and enjoys some sweet gourmet treats with this yummy hamper. 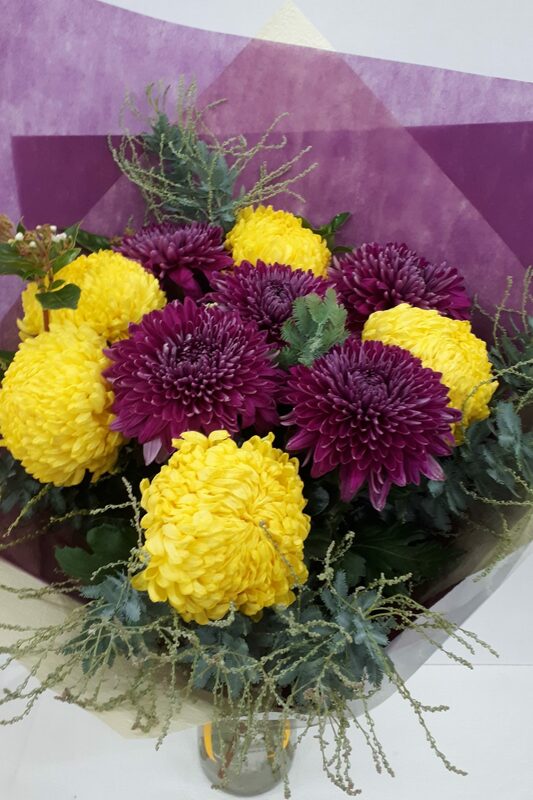 Sensational Chrysanthemum’s ! A Mother’s Day favourite. 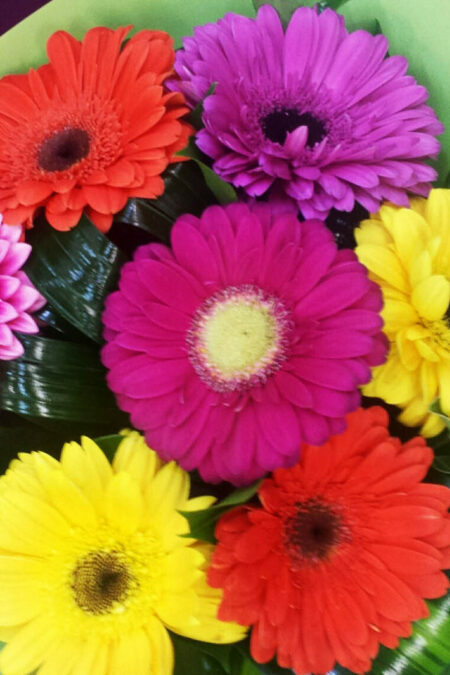 10 stems bright, beautiful, locally grown quality chry’s in a lovely bouquet. 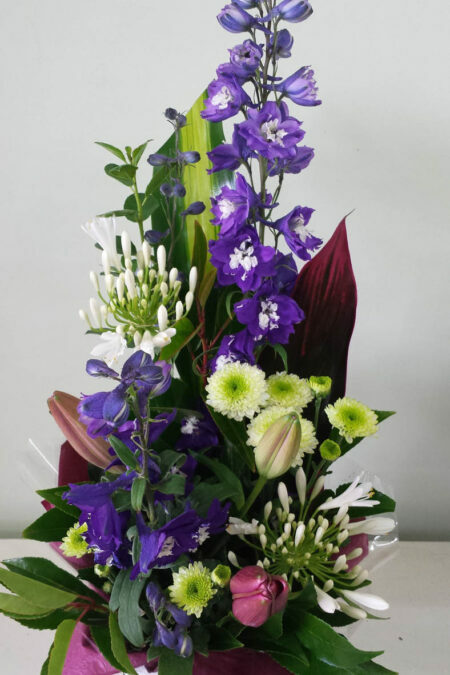 Artificial Design – Let us know your colour preference and the style you like and we will custom design the perfect arrangement to suit your home or work place. Beautiful, unique designs to really impress. 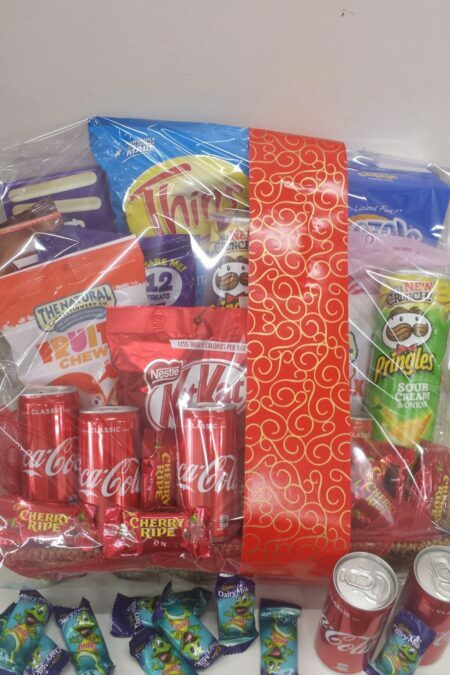 Beautiful array of yummy sweet and savoury gourmet products presented in a white hamper tray. Perfect for many occasions ! 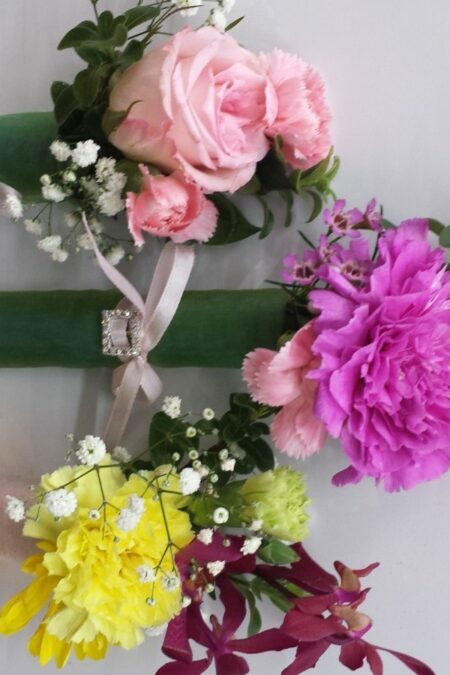 A mix of seasonal flowers and ribbon in soft colours or your choice of colours to suit the memory of your loved one. 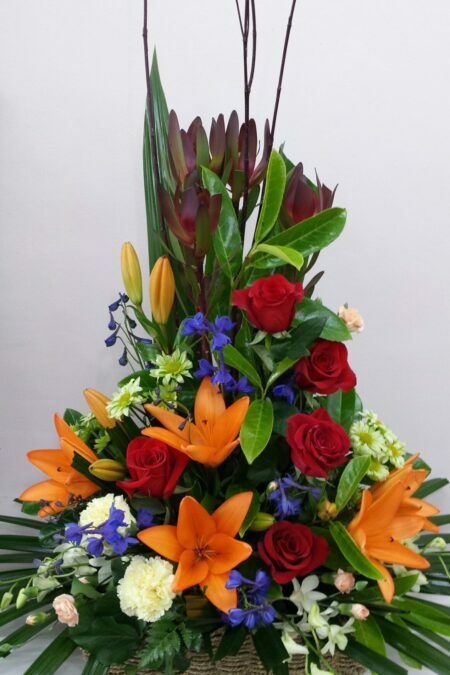 A lovely floral tribute for a service. 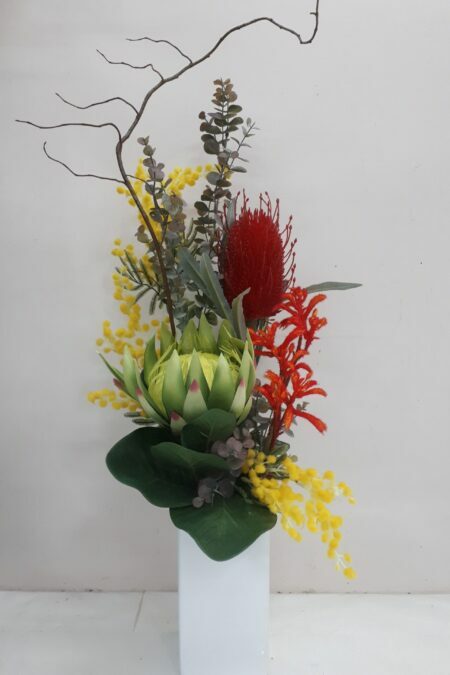 Artificial Blue gum, Kangaroo Paw, Protea, Banksia and flowering wattle, a stunning mix of native and wild flowers in a tall ceramic pot. Everlasting rustic beauty. 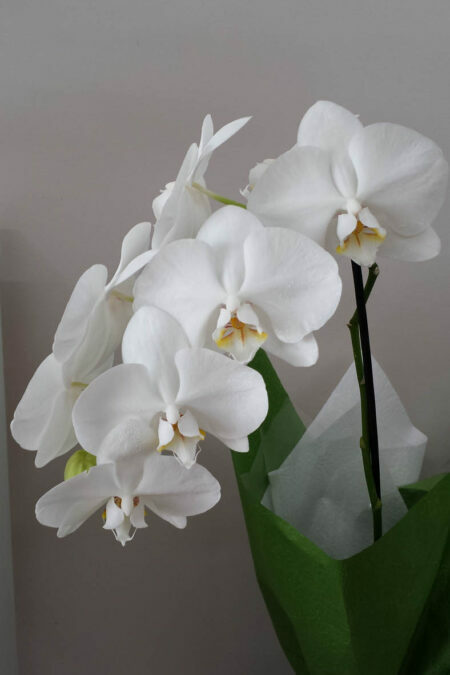 Artificial Design – Stunning double white Phalaenopsis flower stem with tropical orchid leaves in a stoneware pot. Very realistic look and feel. Capture this beauty forever. 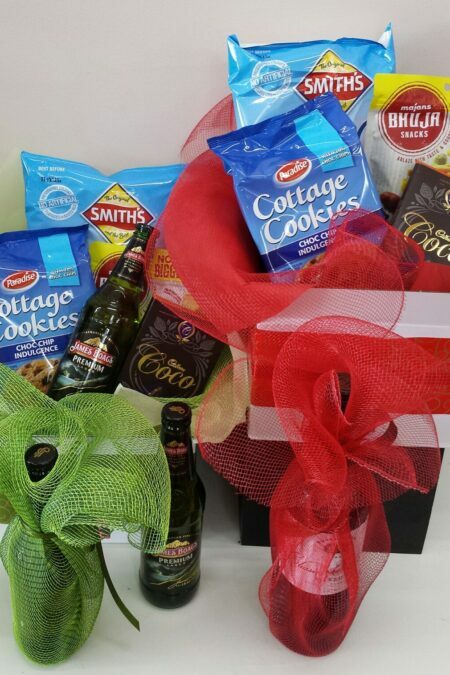 This fun hamper is a yummy selection of party treats and nibbles. 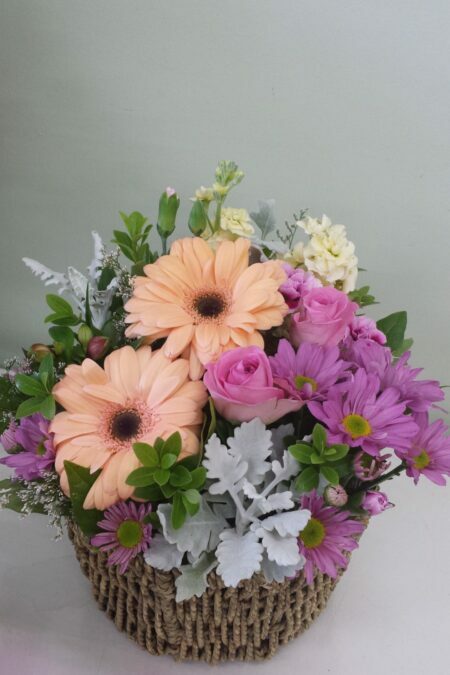 Artificial Design – Gorgeous mix of pastel artificial blooms. Roses, stocks and peonies with foliage in a tall ceramic pot. Keep the garden everlasting. 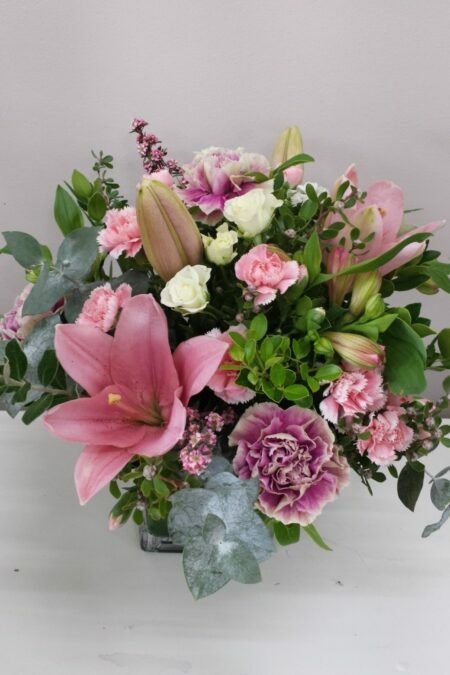 A lovely seasonal mix of pink and white toned blooms with foliage and beautifully gift wrapped. 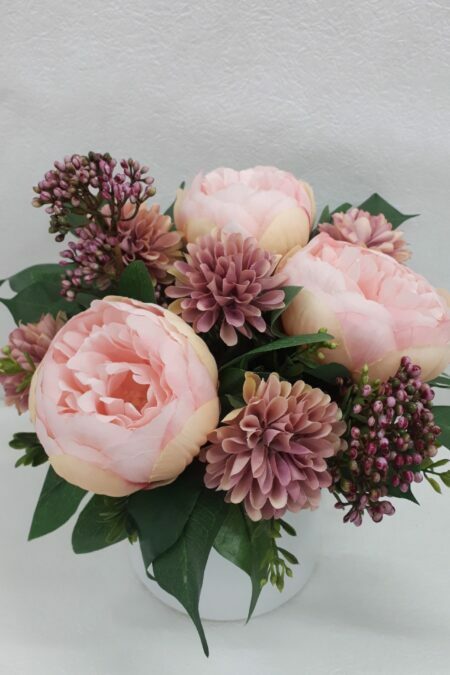 Artificial Design – Beautiful pink peonies and mini chrysanthemums arranged in a white ceramic pot. Lovely artificial design that will last forever. 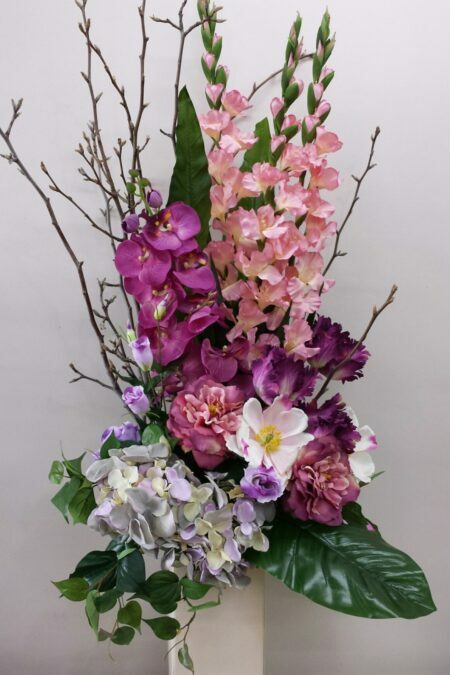 Tall impressive display of artificial pastel toned blooms in a tall ceramic vase. 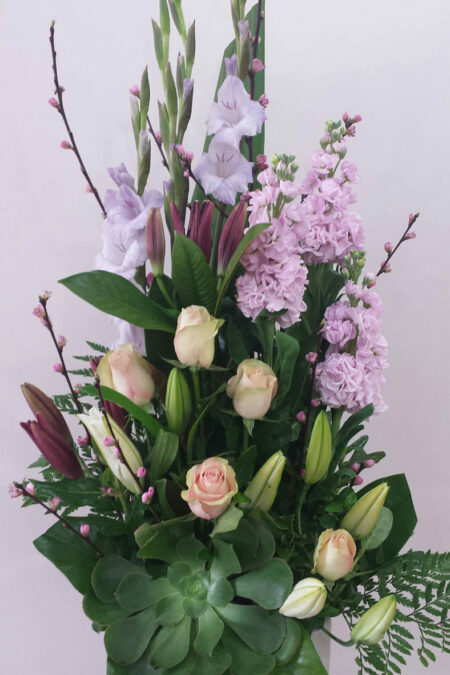 Beautiful gladioli, roses and blossom, the perfect everlasting gift or arrangement for the home. 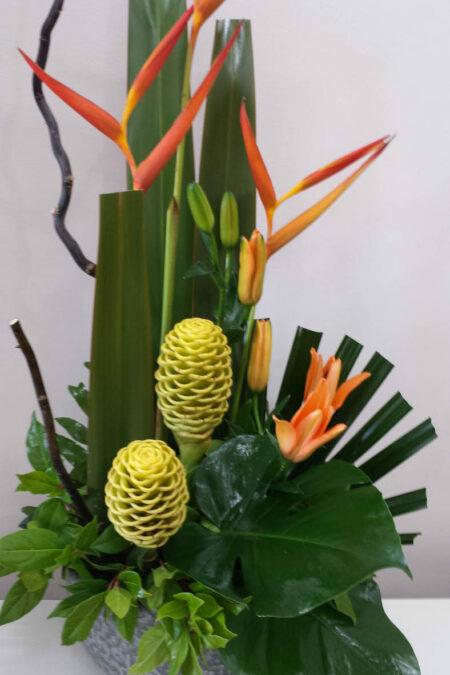 Artificial Design – Bright, bold tropical blooms and colours. 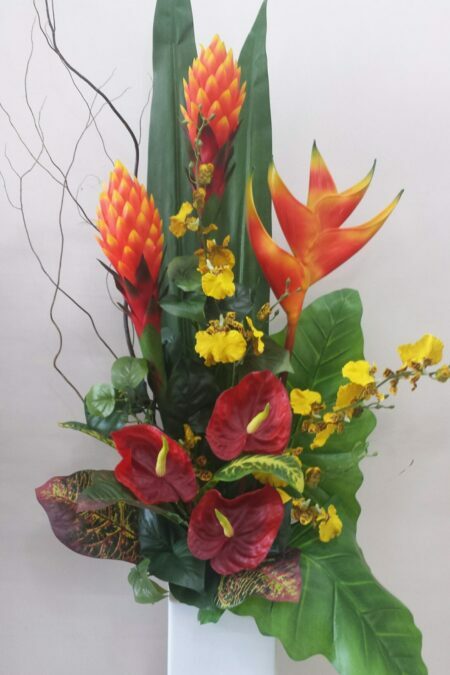 Eye catching orchids, Bird of Paradise and Anthurium blooms and foliage. A fresh rose bloom captured at the perfect moment and preserved to last up to two years. Beautifully presented in a glass vase. Why not add a scented candle to complete the gift? 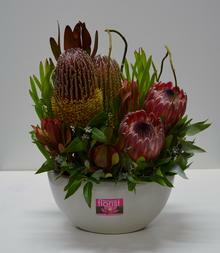 Artificial Design – Beautiful burgundy and pink toned artificial blooms in a ceramic pot. 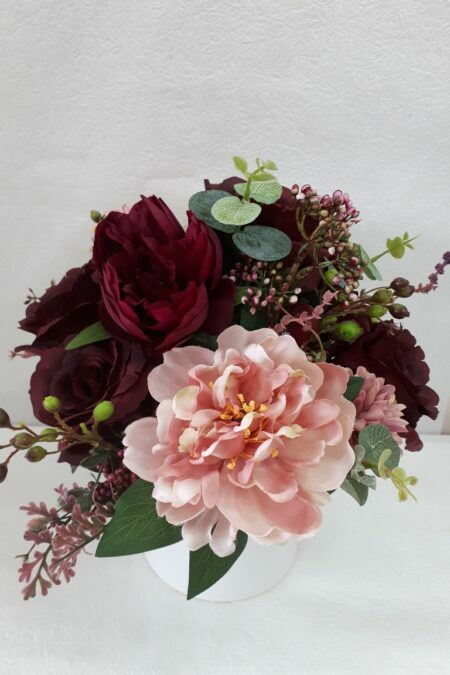 Peonies, garden roses and berries complete this rich and lush design. 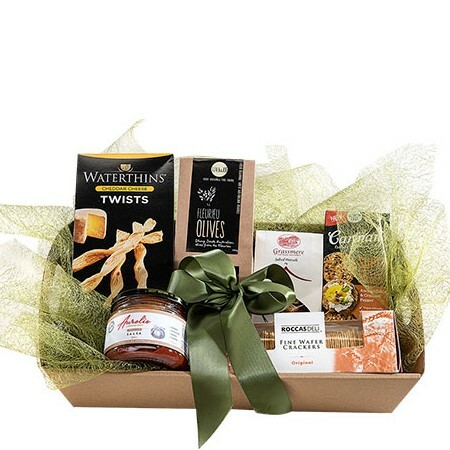 A gorgeous mix of savoury gourmet products nicely presented in a hamper tray. 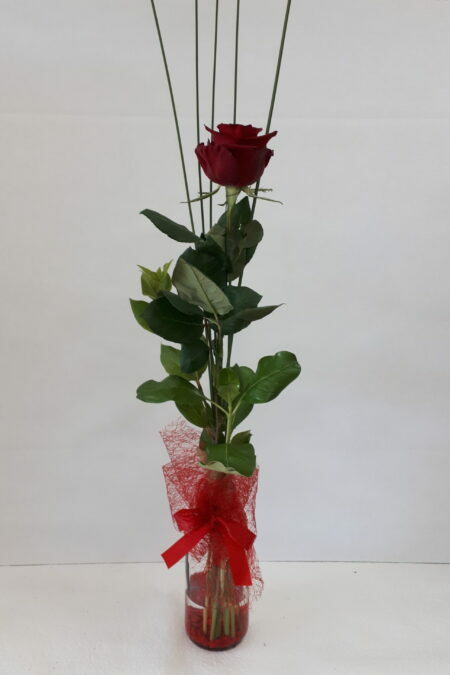 Treat someone today …..
One long stem red rose in a glass vase. 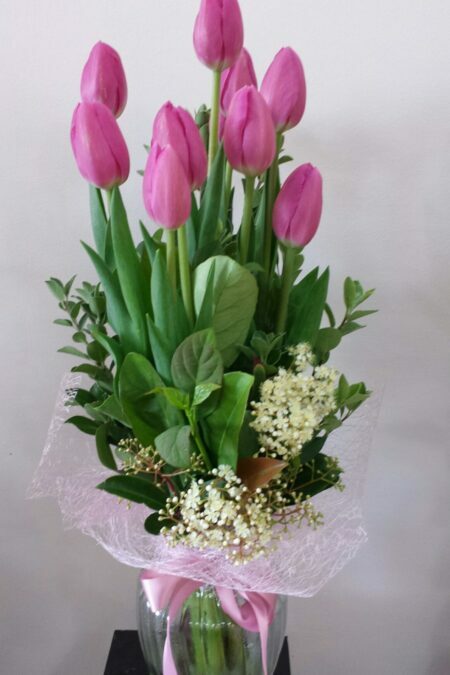 A beautiful gesture for your special someone. Why not add a scented candle or chocolates to complete the gift? 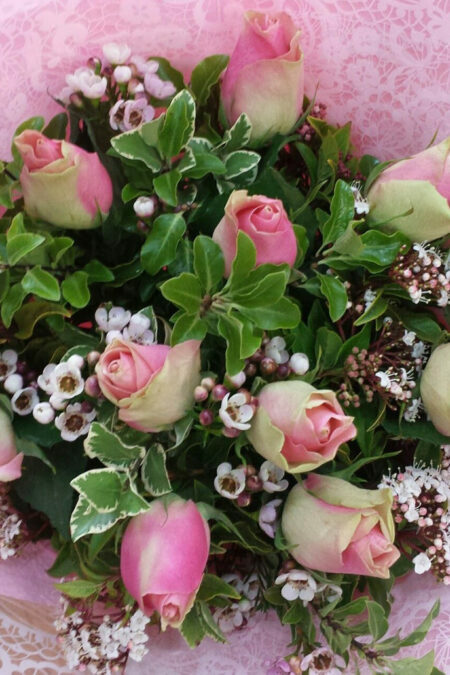 Luscious cream or delicate soft pink premium roses in a bouquet with lush foliage and gift wrap. 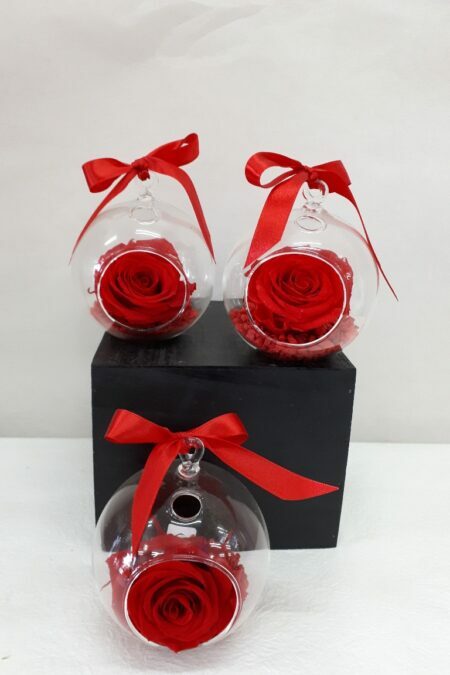 Why not add a glass vase to complete the gift? 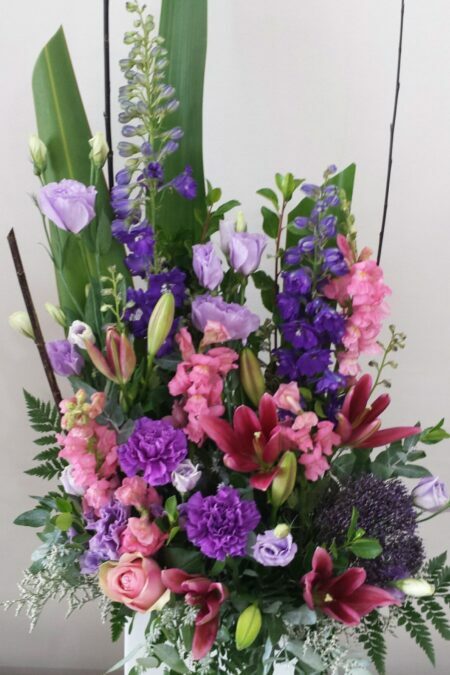 A beautiful and impressive display of seasonal blooms. 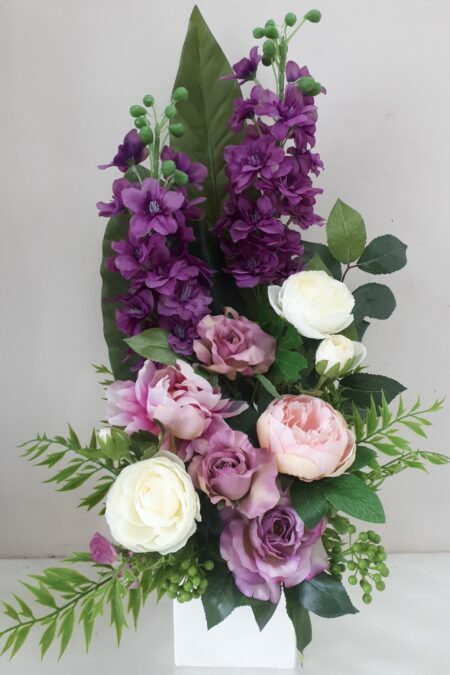 You can select the colours that best reflect the life of your loved one and we can custom design a array of blooms to be placed at the service or gathering. 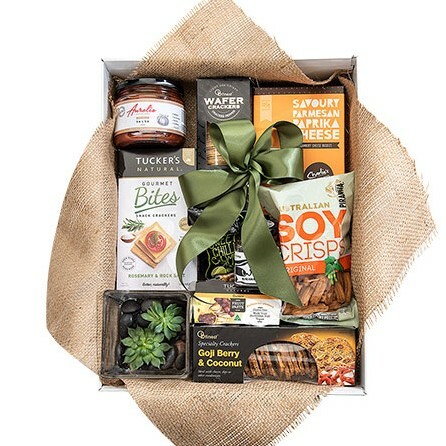 Tasty savoury gourmet products with a mini succulent hanging pot. Perfect gift for that hard to shop for loved one! 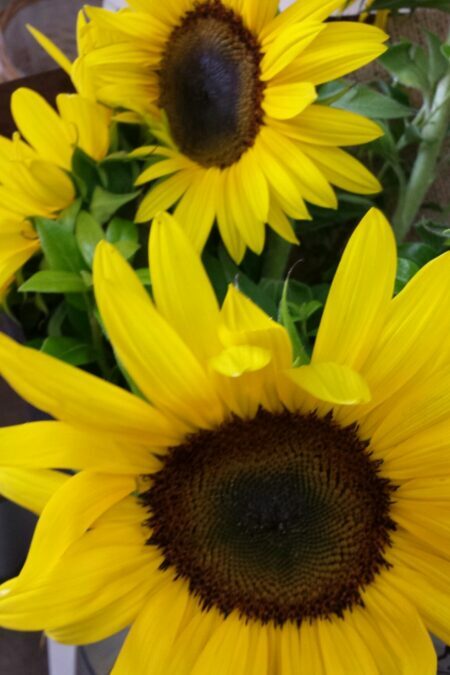 Big, bright and happy sunflowers, always a favourite. 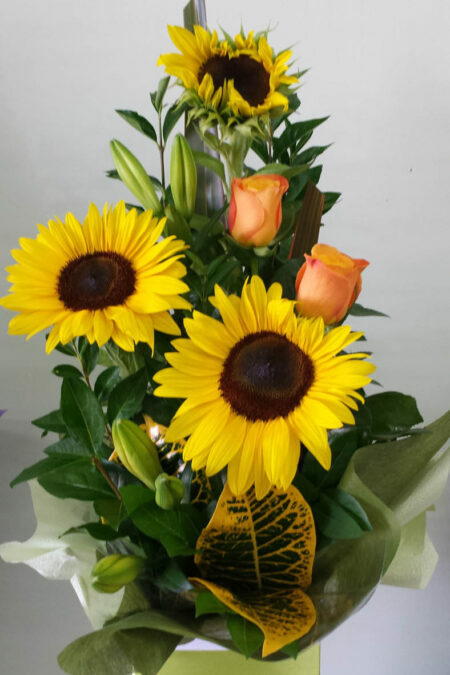 Gift wrapped bunch of sunflowers ready to brighten someone’s day…. Artificial Design- Perfect little gift to last forever. 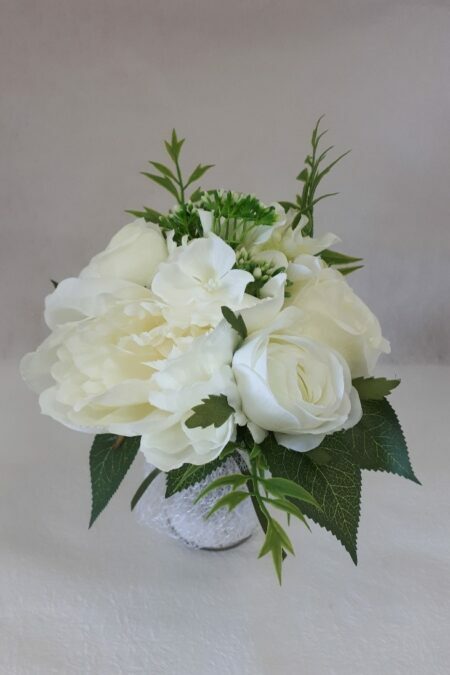 Gorgeous vintage style posy of artificial peony, roses and hydrangea in a glass vase. 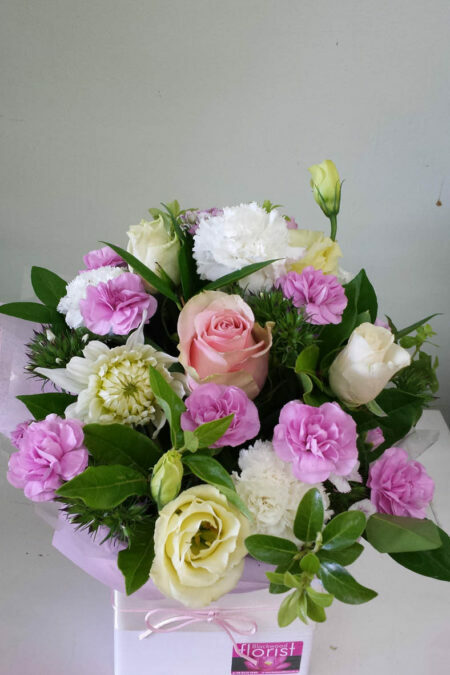 Your choice of crisp white or soft pink posy. 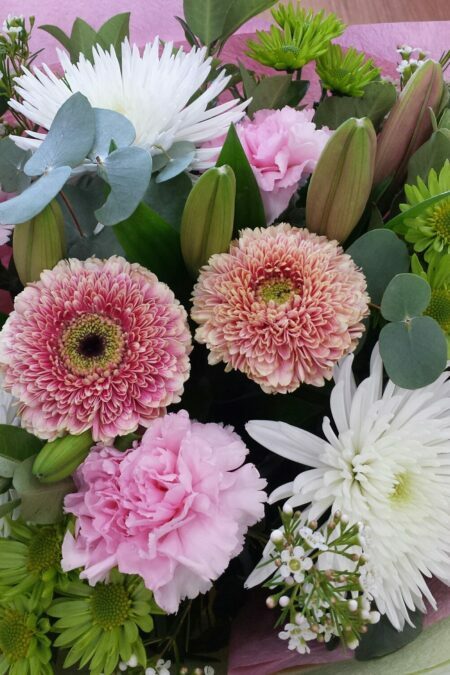 A beautiful natural gathered bouquet with a mix of stunning seasonal blooms. 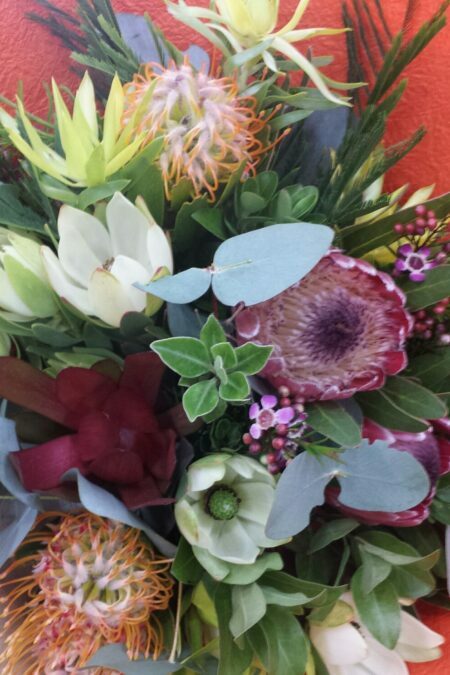 This wild bouquet will surely impress. Lovely mix of cottage flowers and foliage presented in a rustic wood box. A favourite gift for many occasions. 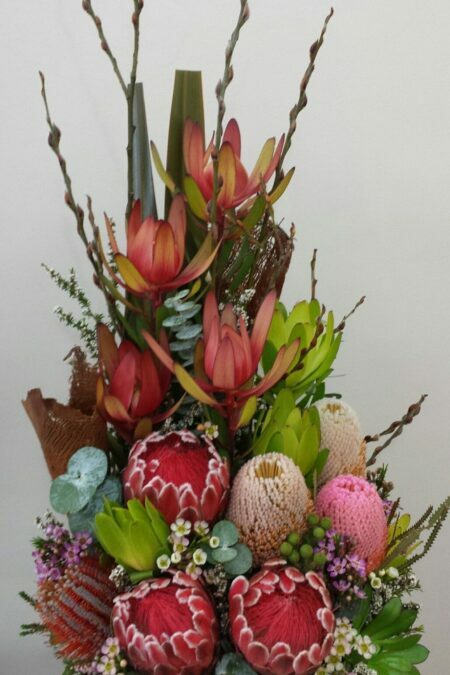 Low design in a beautiful Seagrass basket with bright seasonal blooms and foliages. 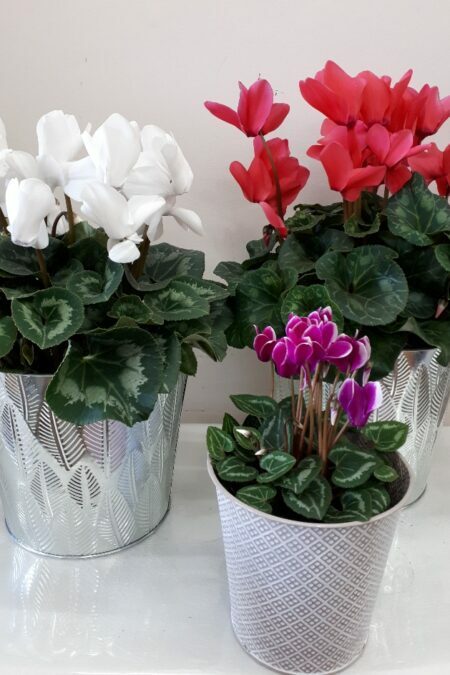 Beautiful flowering Cyclamens plants make a perfect, long lasting gift. An array of colours presented in cute textured tin pots. 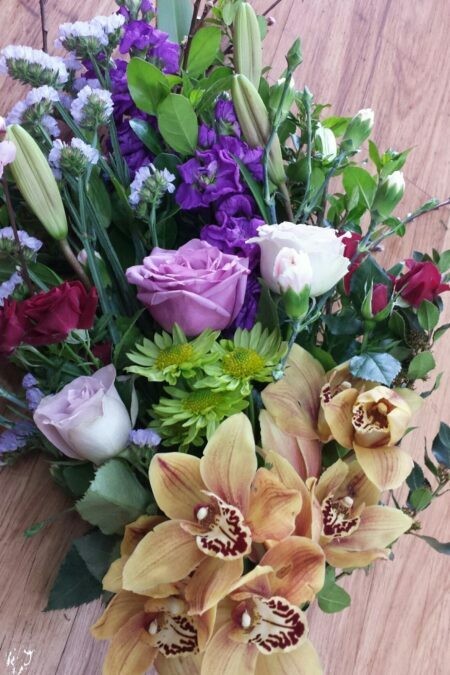 Beautiful seasonal flowers used to create a handtied bouquet finished with complimenting gift-wrap. 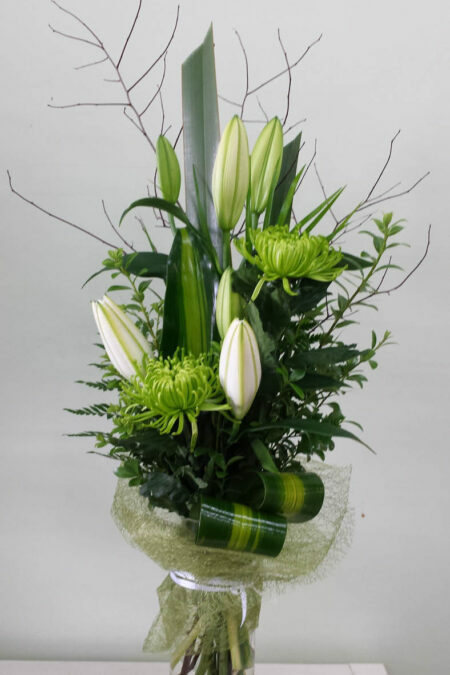 Arrangement of fragrant Oriental lilies & foliage beautifully presented in a gift wrapped Vase. 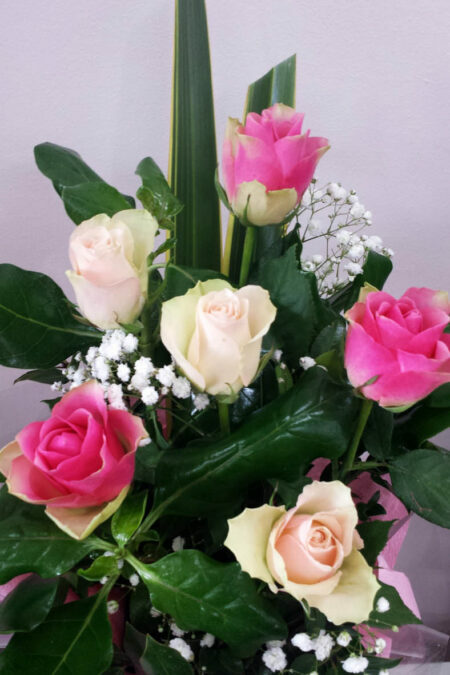 Lovely gift box with 6 stems of pastel coloured roses and complimenting foliages. Seasonal flowers arranged in a ceramic pot. Your choice of colours. 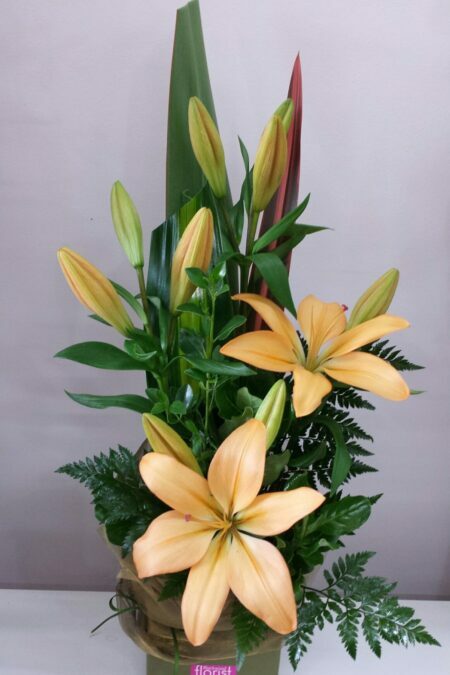 A simple but elegant design of long lasting Asiatic lilies in a ceramic pot. Beautiful for any occasion. 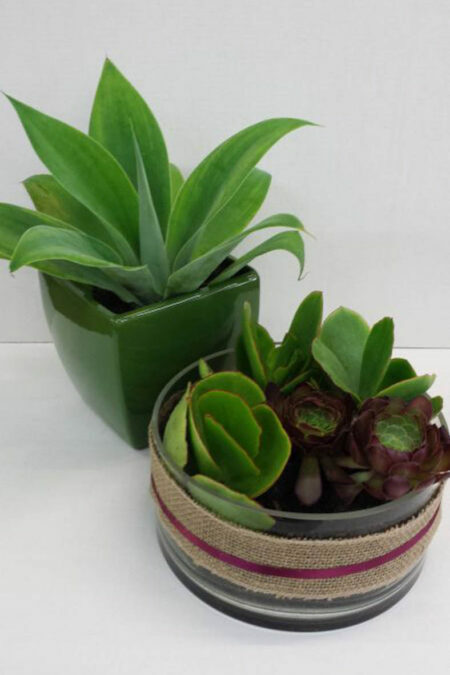 Beautiful selection of long lasting succulents in a delicate fish bowl glass vase perfect for any home. A modern twist on a classic favourite. 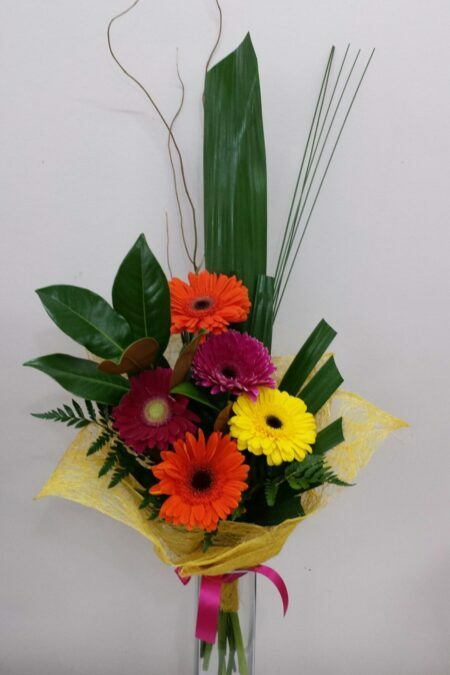 Tropical leaves with a cluster of bright Gerberas finished with willow and gift wrap. 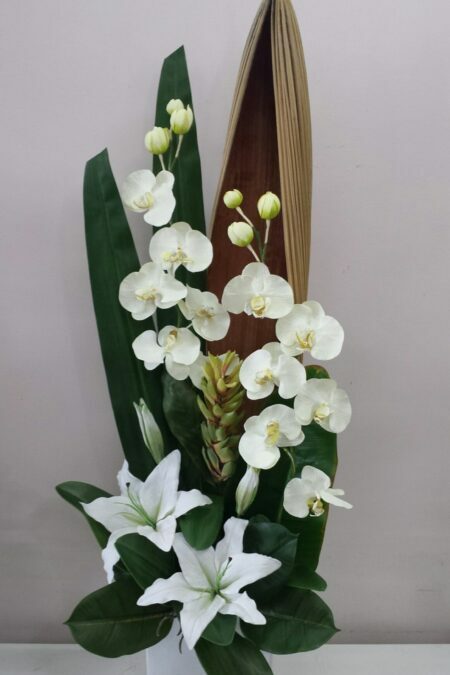 Impressive tall ceramic pot design with an array of beautiful blooms. 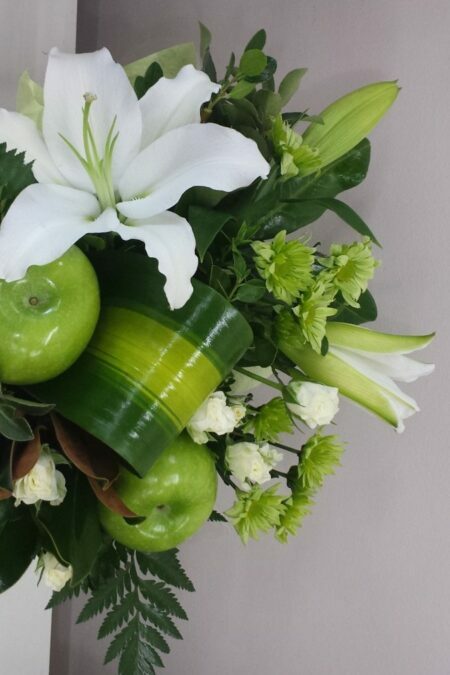 Crisp and fresh this apple arrangement suits many homes with cool white and green flowers. A great end of year gift or thank you this yummy selection of nibbles and your choice of Premium Boags Beer or a hearty Grant Burge red wine. 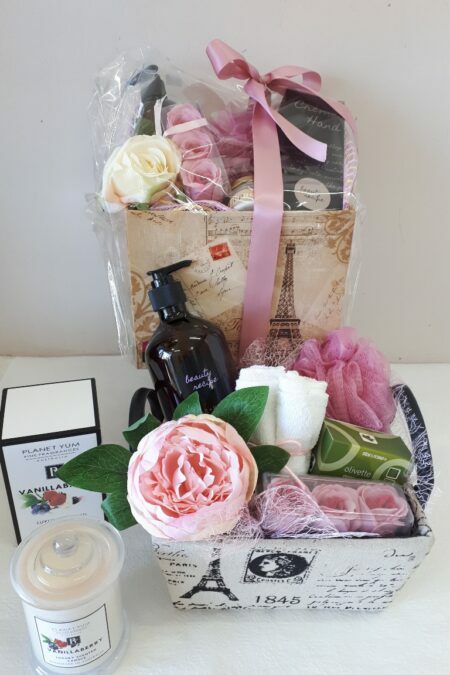 Beautiful pamper products in a Paris Gift box. A mix of gorgeous Body wash, rose soap petals, hand cream, lip gloss and body spunge. Packs can be tailored to suit your loved one. 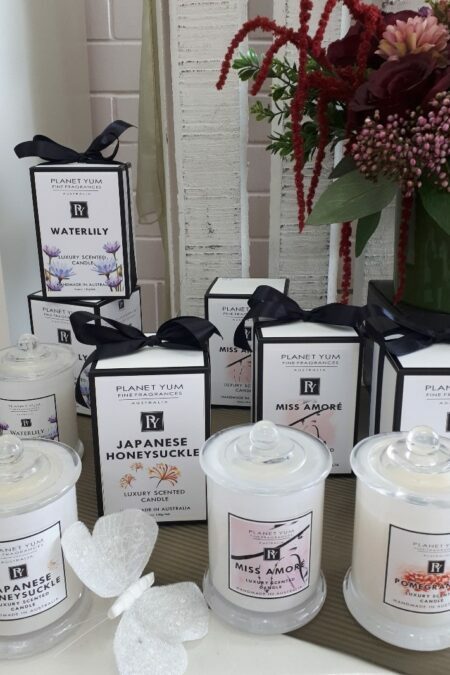 Why not add a scented candle to complete the pamper gift? 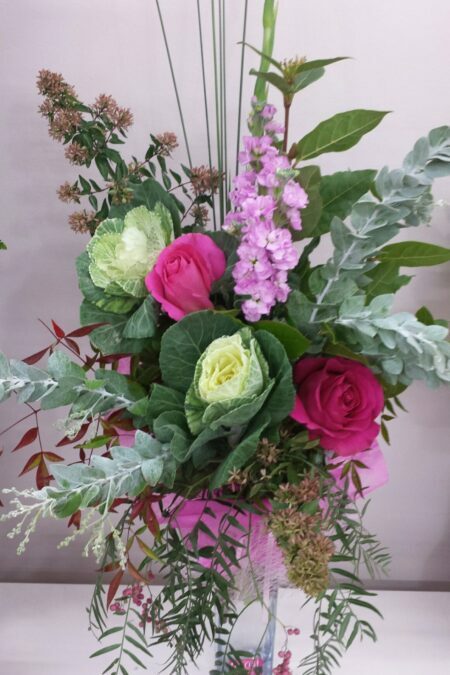 A tall upright bouquet with a variety of seasonal flowers and foliage, beautifully gift-wrapped. 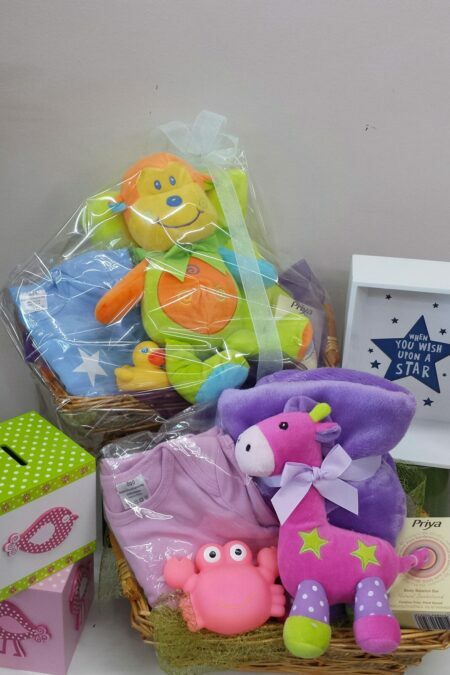 A beautiful welcome hamper with a selection of baby care products or blanket with your choice of a blue, pink or neutral coloured teddy bear. 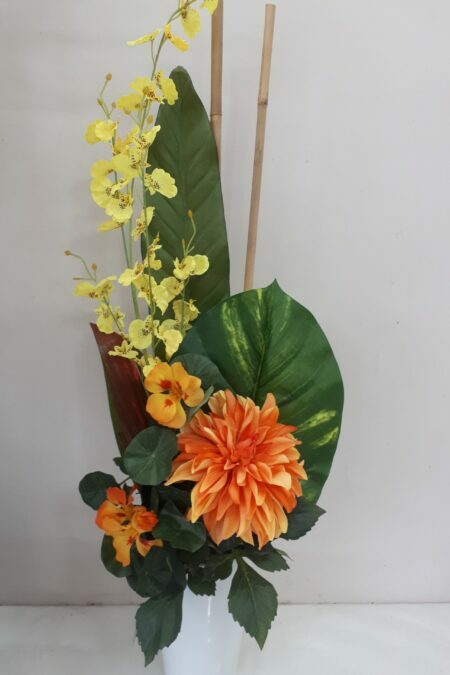 Modern taller style bouquet with a mix of blooms, lush foliage and sticks with a fabric wrap. Inspired by Japanese string art this unique gift is a living succulent or fern to hang or place on a special dish. 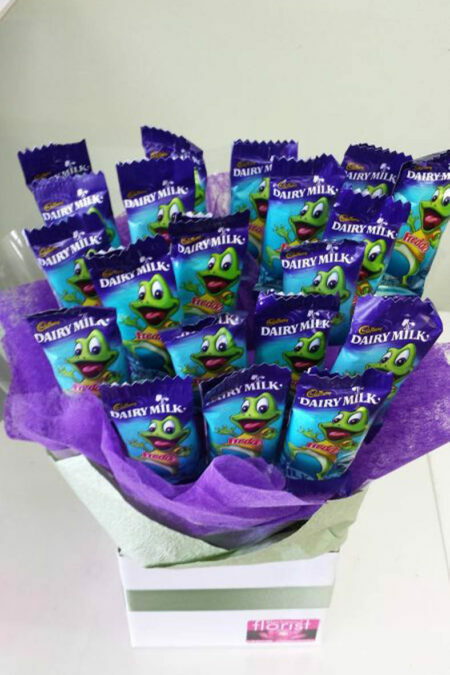 A yummy bright gift box with 20 fun-size Freddo Frogs ready to eat. A single dainty, magnetised glass vase with a petite flower arrangement is a unique gift. Place on the fridge and enjoy everyday! 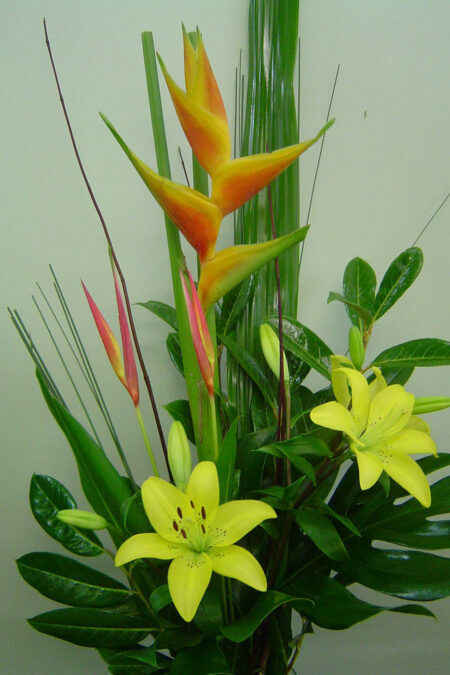 A bright tropical design with tropical foliages in a ceramic pot. 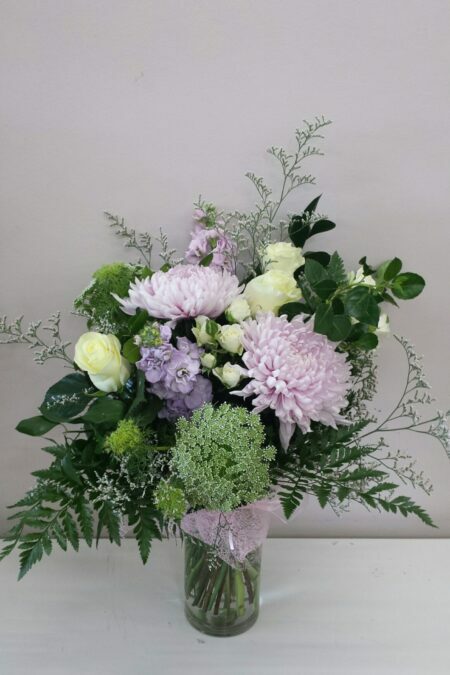 A florist favourite this arrangement is truly a wonderful piece for any occasion, bringing the garden indoors. 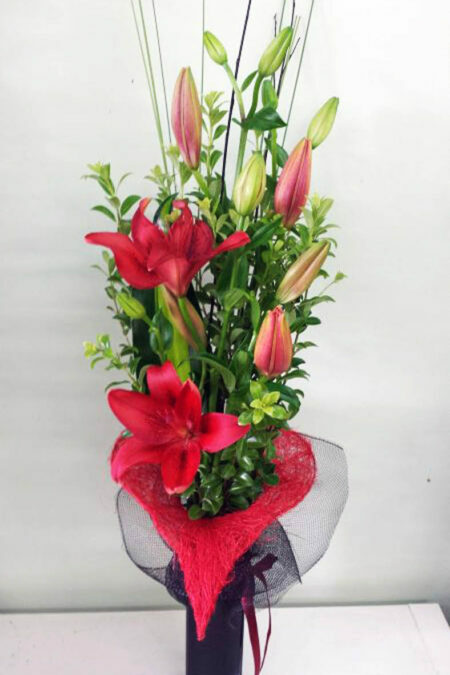 Long lasting Asiatic Lilies arranged in a glass vase with a decorative heart and gift wrap. Available in pinks and oranges. Beautifully displayed succulents or Agave plant in a lovely container. Suitable for indoors or outside entertaining area. 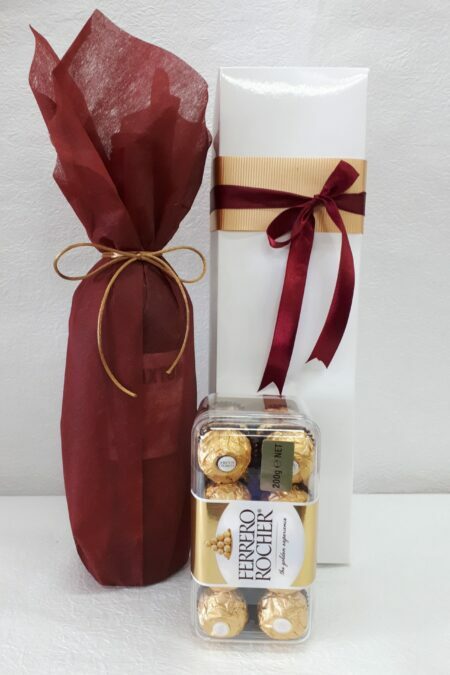 South Australian Red or White wine with Ferrero Rocher chocolates presented in a gift box and bag. 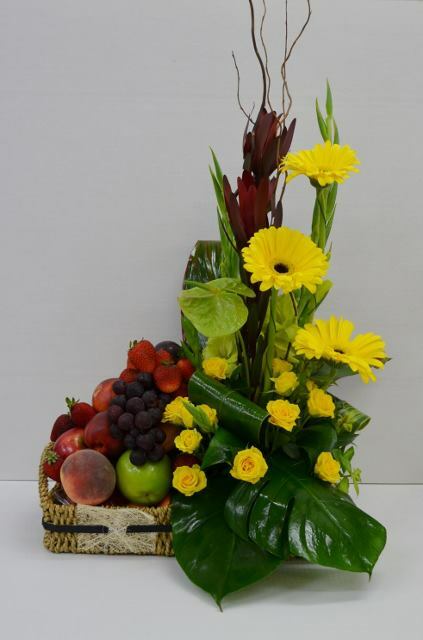 A perfect gift of flowers and fruit displayed in a seagrass basket. Natural and rustic mix of native and wild flowers in complimenting giftwrap. 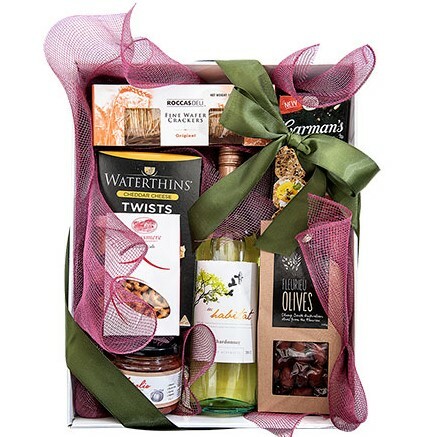 A selection of sweet or savoury treats attractively displayed in a white gift box with a bottle of red or white wine. 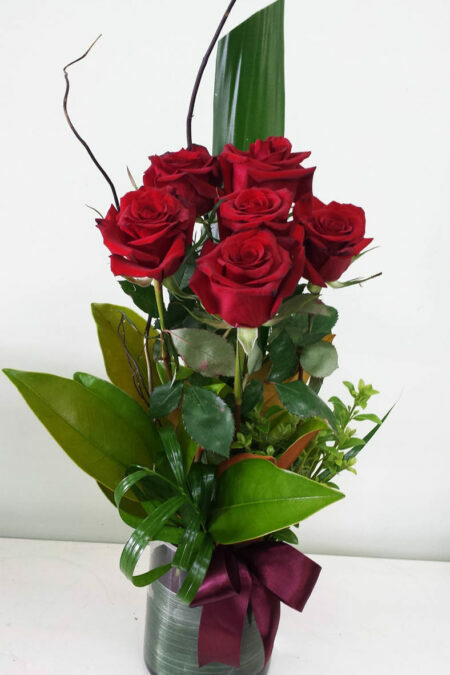 Roses, Disbuds and a mix of flowers in a modern grouped design presented in a glass cube. 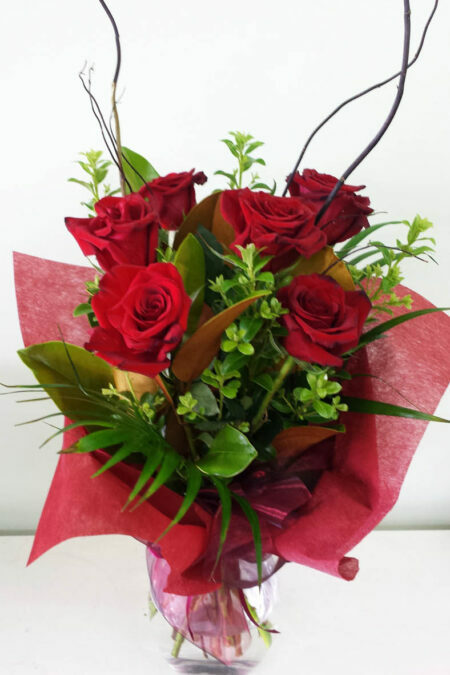 6 long stem red roses with lush foliage arranged into a bouquet. 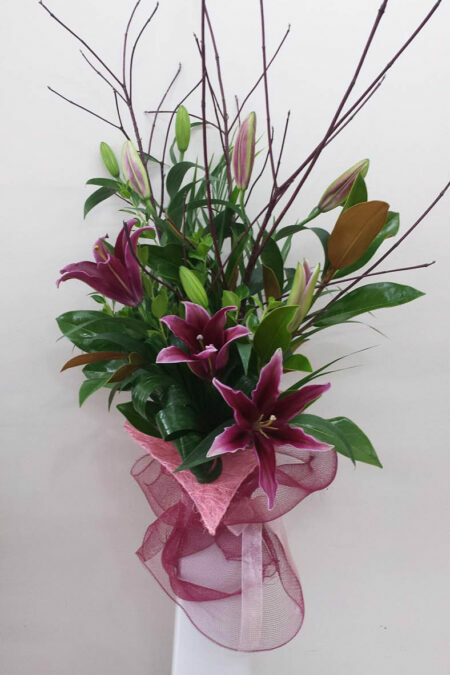 Romantic mix of red toned flowers arranged with complimenting foliages in a box. 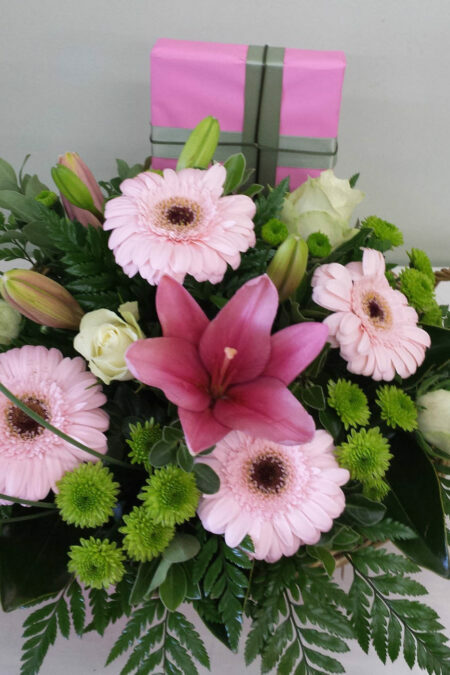 Pink and white flowers arranged in a traditonal posy style in a white box. 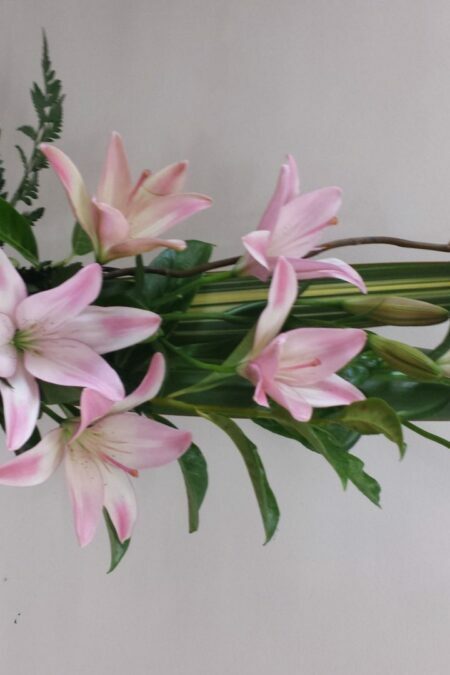 A selection of Oriental lilies in a premium glass dish vase with tropical foliages. Low glass vase dish with 6 long stem premium roses and tropical foliages. 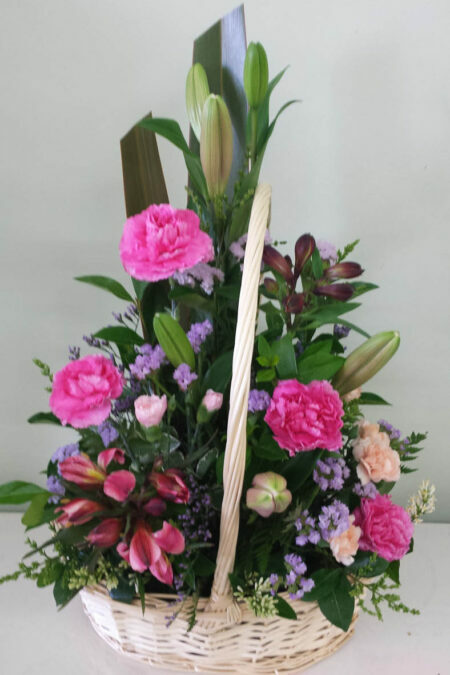 Large and impressive display of quality flowers presented in a woven basket dsesign. 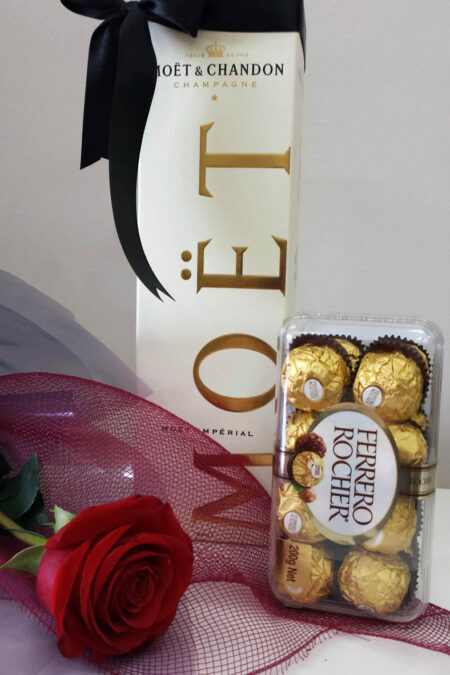 Classic bottle of Moet & Chandon with Ferrero Rocher Chocolates and Single rose presentation. 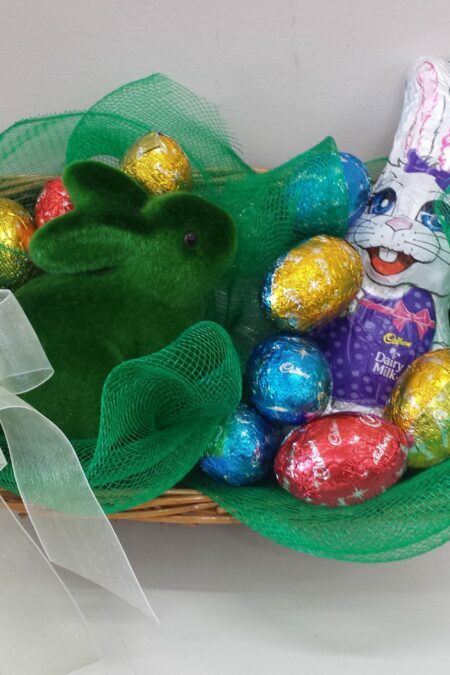 A gorgeous Easter gift featuring a ceramic vase with lovely Lilies and a Cadbury chocolate bunny. 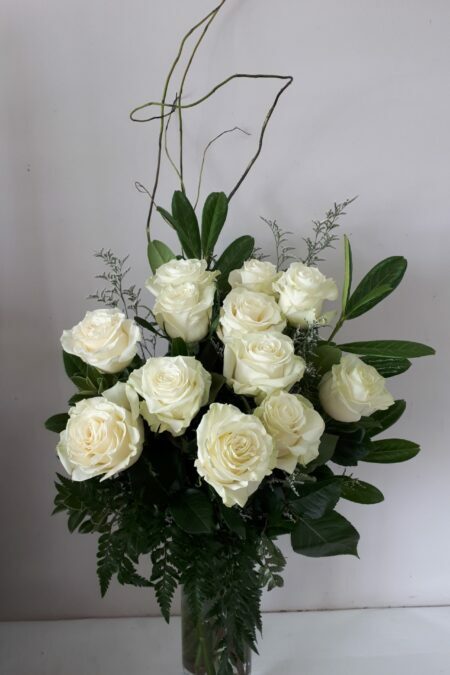 12 beautiful long stem roses arranged into a box. 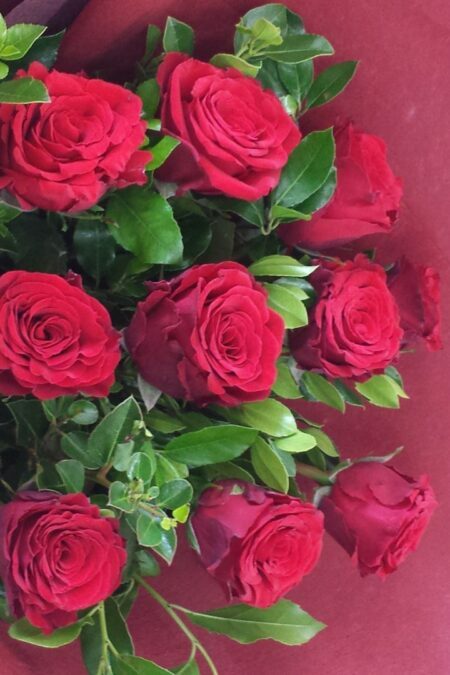 Or if you prefer these quality roses can be arranged with lush foliage into a bouquet. 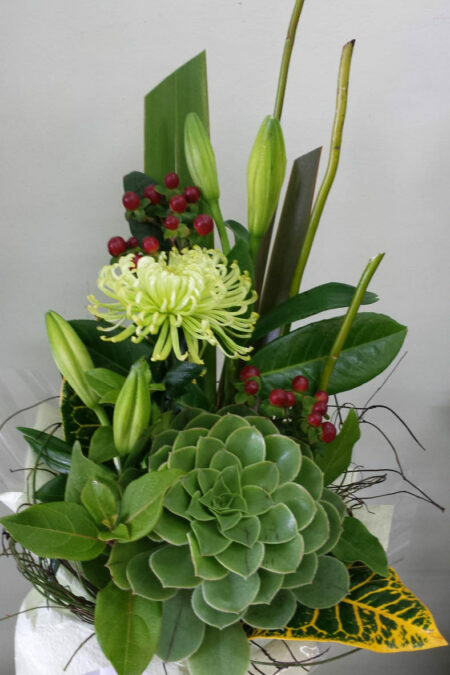 Mix of modern succulents, berries, lilies and Disbuds with tropical foliages. 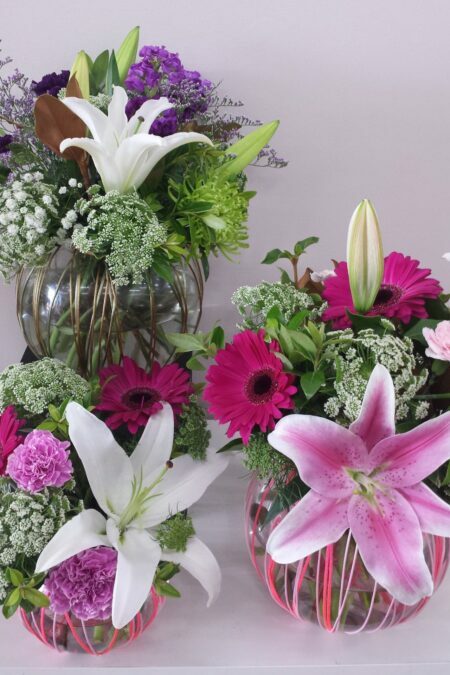 Pretty mix of seasonal blooms in a delicate fishbowl glass vase. 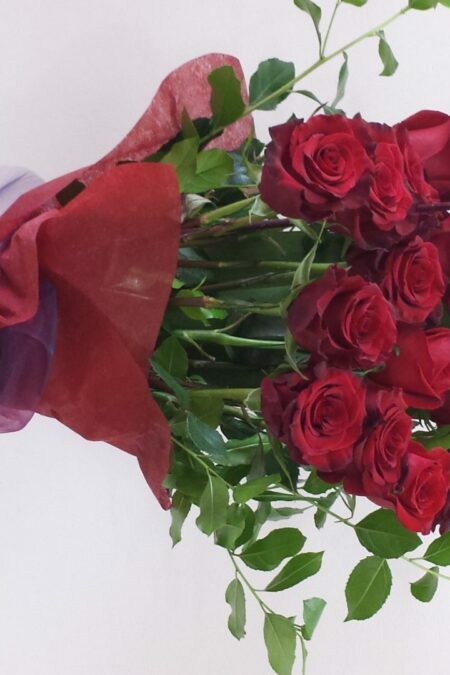 Stunning 24 long stem premium roses arranged in a bouquet that will really impress! 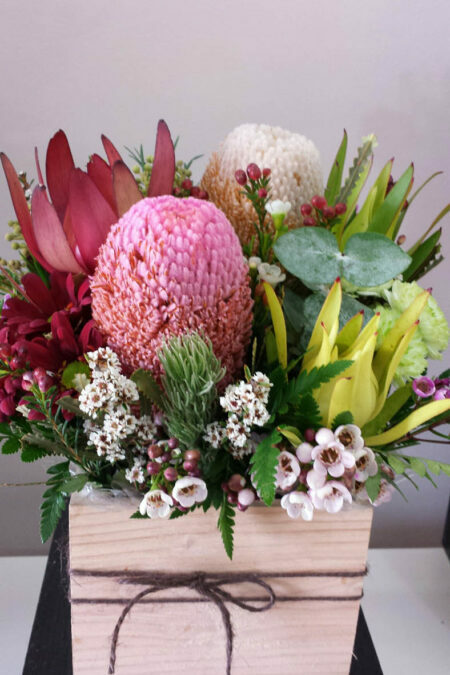 At Blackwood Florist we can design many styles of flower arrangements to suit your needs for that special person, with delivery to all suburbs across Adelaide, the Adelaide Hills and outer suburbs. 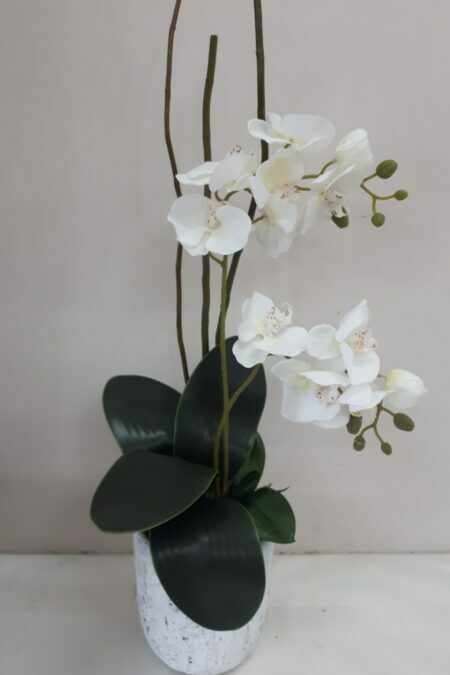 We can creatively arrange fresh flowers in a box design, ceramic pot design, glass vase arrangement or something tropical for that something different! 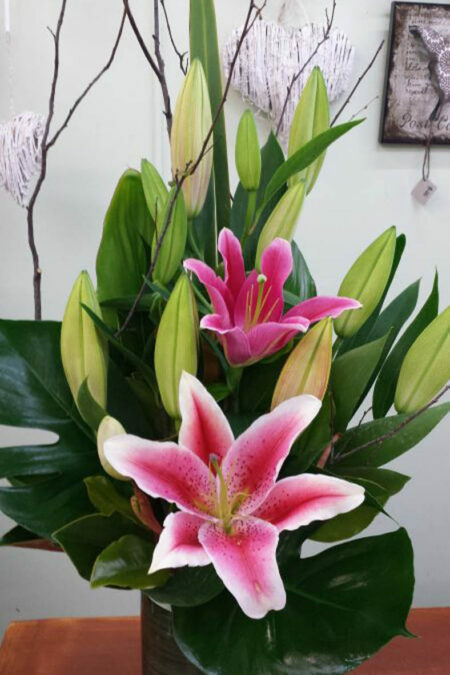 Blackwood Florist strives to find the freshest local and imported flowers for our arrangements. 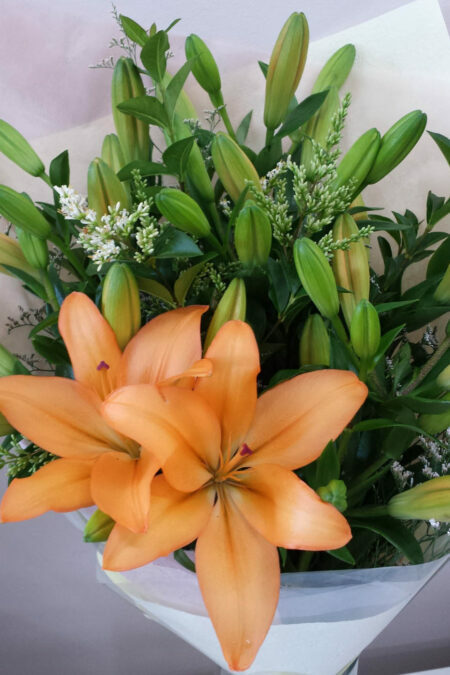 We have an array of beautiful blooms such as roses, lilies, orchids, peonies, native and wildflowers, sunflowers and many, many more. 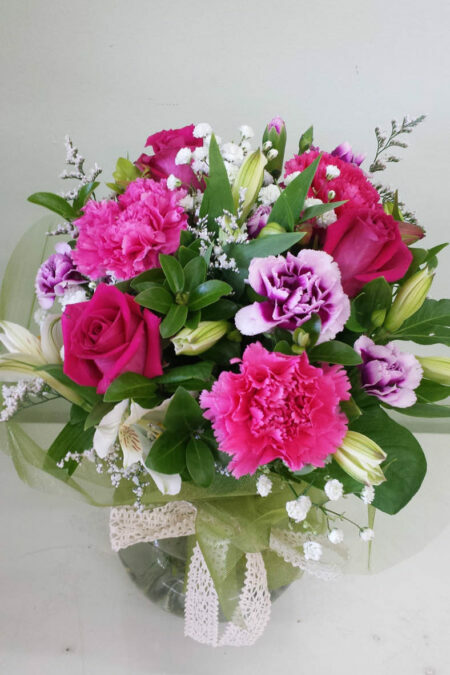 We cater for all tastes and can design traditional or vintage style bouquets through to more modern and contemporary arrangements. 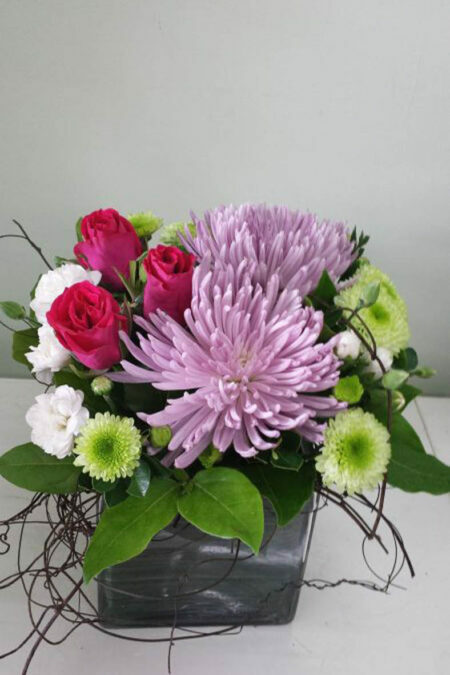 We also make ceramic pot designs, posies, simple flower wraps, and hand-tied modern bouquets. 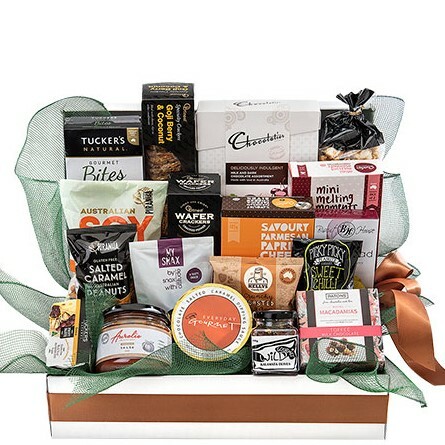 If it’s a gift basket to say thank you to someone, or gourmet hamper or fruit hamper to spoil that special person, we have it all and can cater to suit your needs. All of our hampers & gift baskets are available to view online, meaning you’ll be able to find something you like, across our large range. 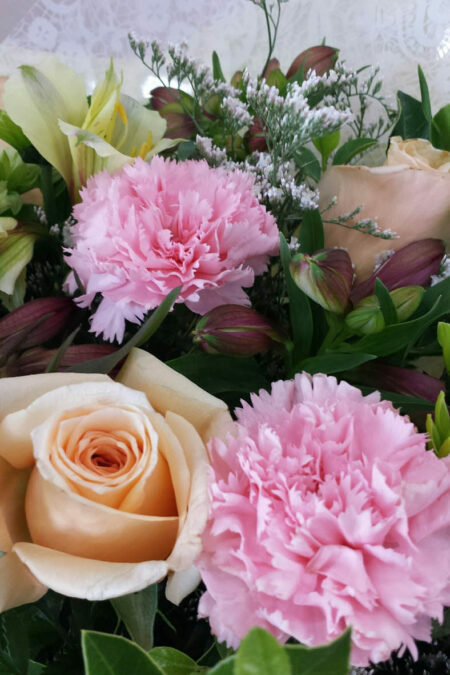 Our flowers are sourced fresh daily from our selection of local market growers, with each flower hand-picked by the owner, so that only the freshest flowers are used in your arrangements. This means that your gift will be enjoyed long after it has been delivered. 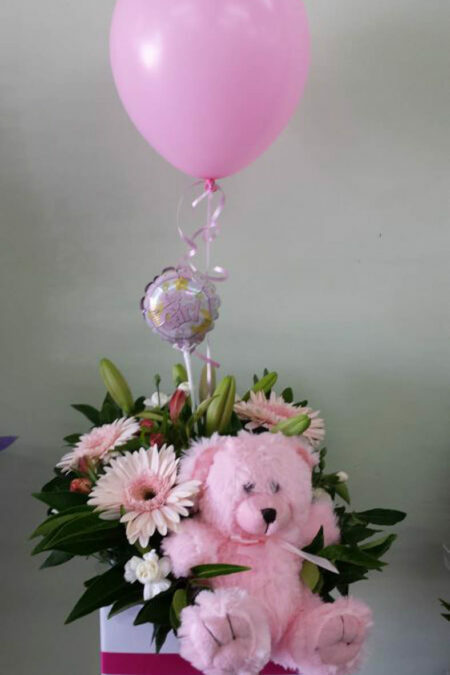 What better way to wish someone a happy birthday, thank you, happy retirement, welcome to your new baby by sending them flowers. 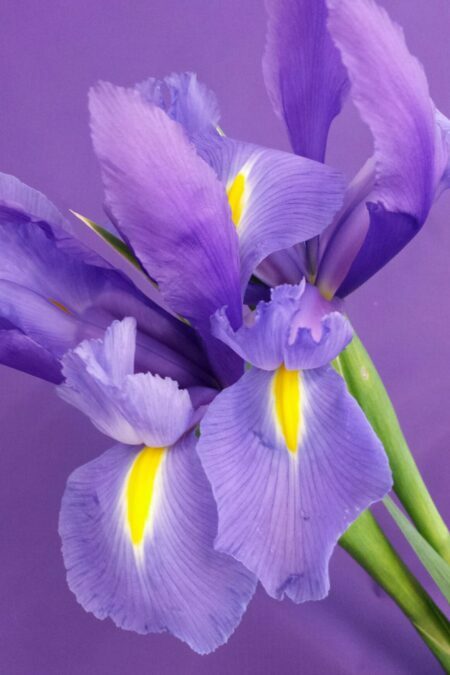 Flowers feed the soul and provide hours of enjoyment and beauty. 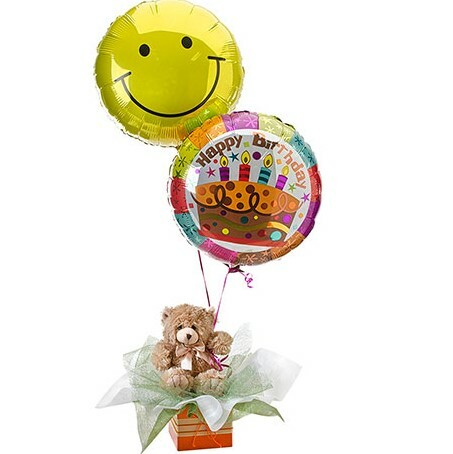 They can give the home life and ambiance, mark an occasion and provide wonderful memories of a special day. 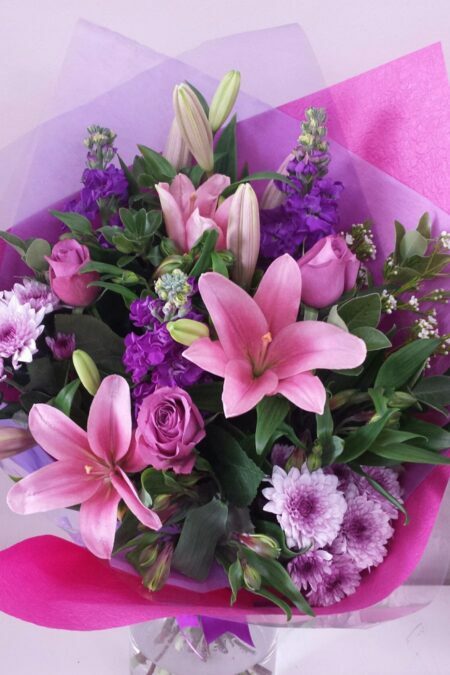 At Blackwood Florist we have a huge range of Mother’s Day flowers for your special Mum, to let her know how much you love her. 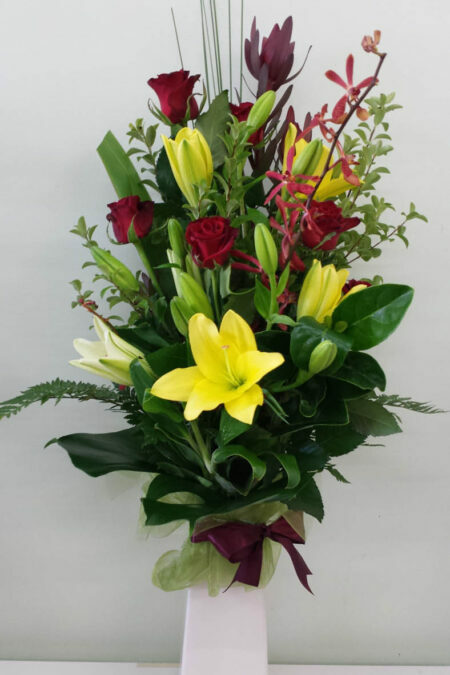 We offer delivery to all suburbs across Adelaide, the Adelaide Hills and outer suburbs. 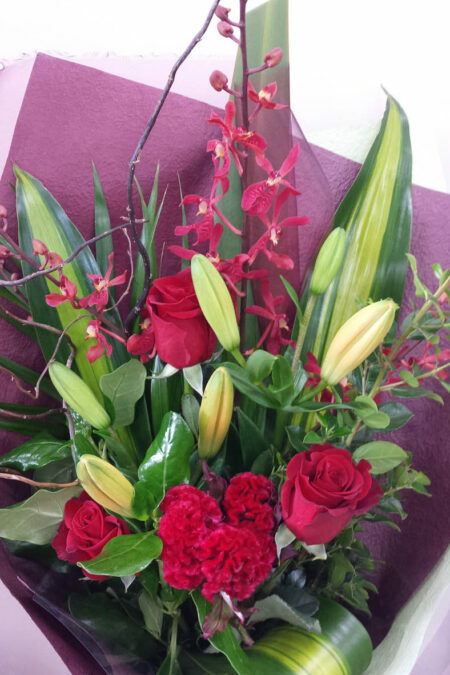 Why not add a glass vase to your chosen flower arrangement for her to enjoy, yummy chocolates or a quality South Australian red, white or sparkling wine. 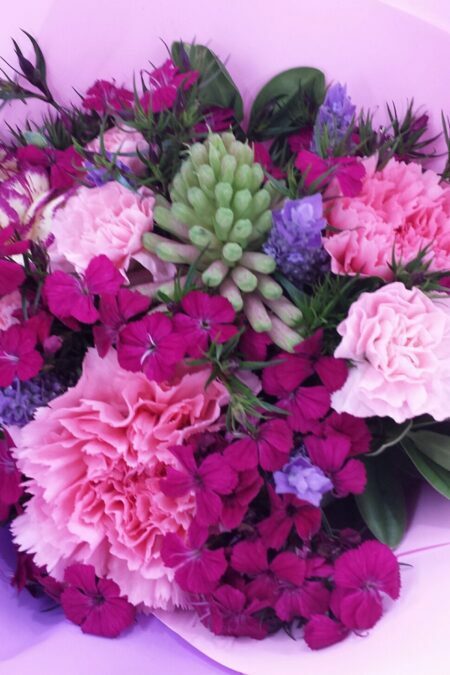 We can creatively arrange fresh flowers into an arrangement, bouquet or basket design, or a pamper pack or gourmet hamper if you’d prefer. 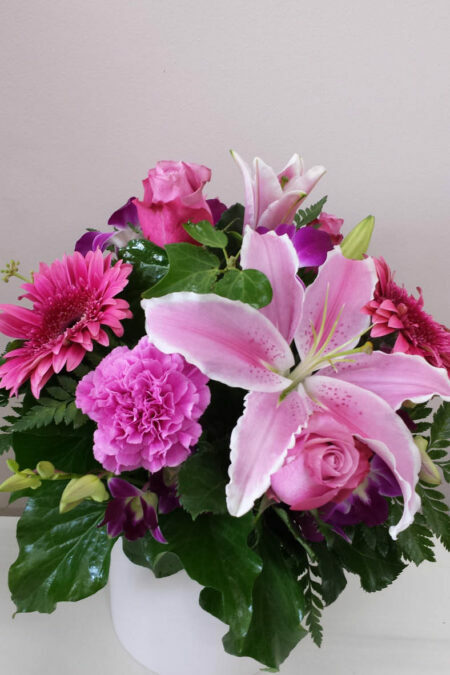 Browse through our selection of sympathy flowers to let someone know that you are thinking of them in their time of loss or time or difficulty. 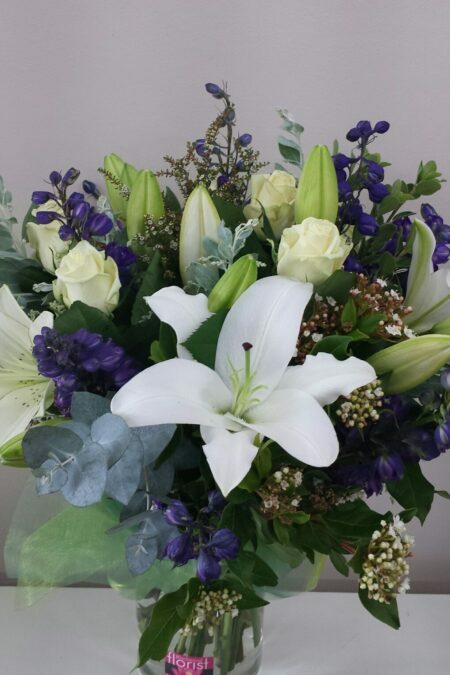 Flowers can be very important at a time of bereavement so we strive to give you caring and personal service to help you choose the right combination of flowers. 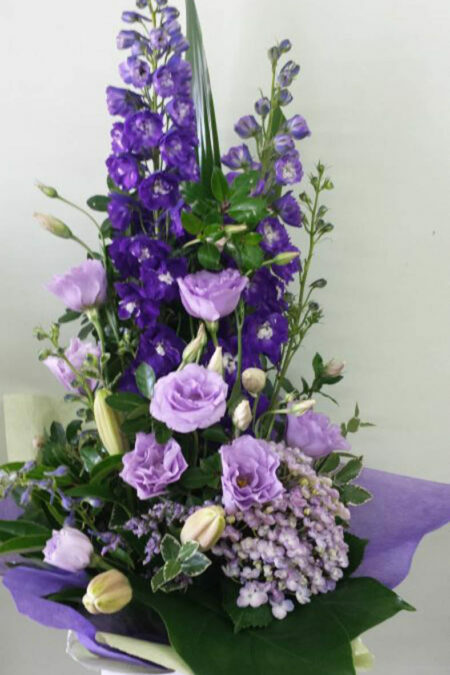 We can also tailor your design to celebrate the life of a loved one by including their favourite flowers or colours. 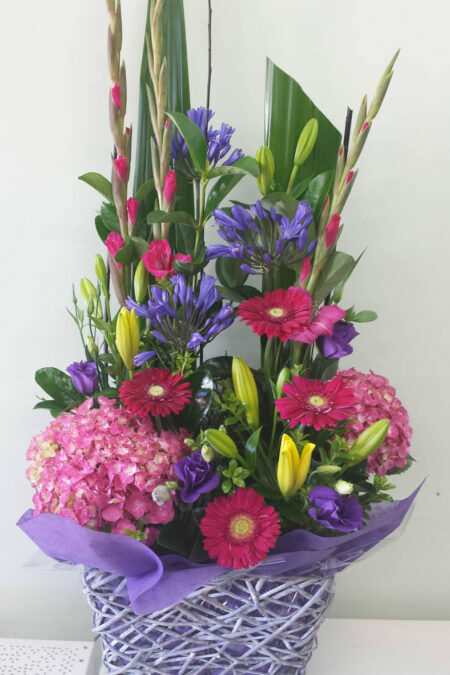 We offer delivery to all suburbs across Adelaide, the Adelaide Hills and outer suburbs. 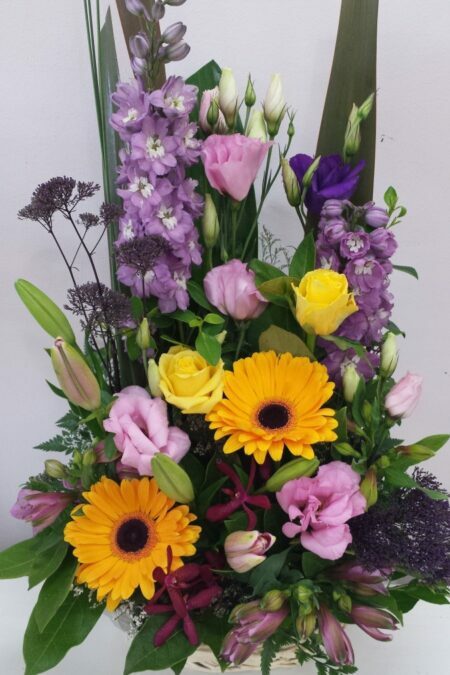 We can creatively arrange your sympathy flowers into an arrangement, bouquet or basket design, or perhaps a fruit hamper to the home or wake if you’d prefer. 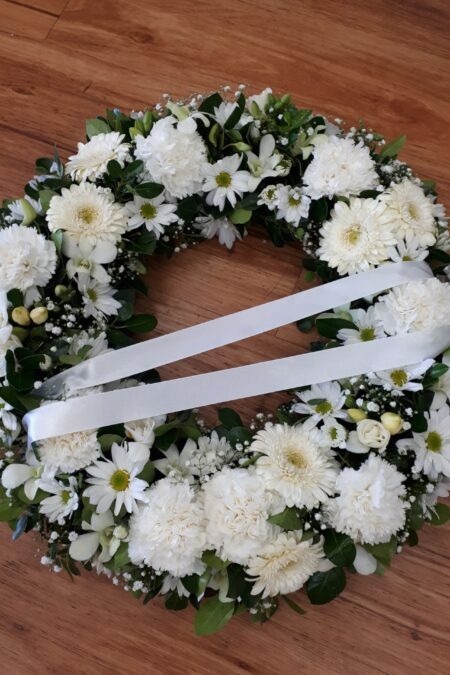 If you are planning to organise the main casket tribute Blackwood Florist’s kind and caring staff will help you choose the best flower combination to reflect your loved one and organise all the details regarding the service and any gathering’s after which may require moving the flower tributes. 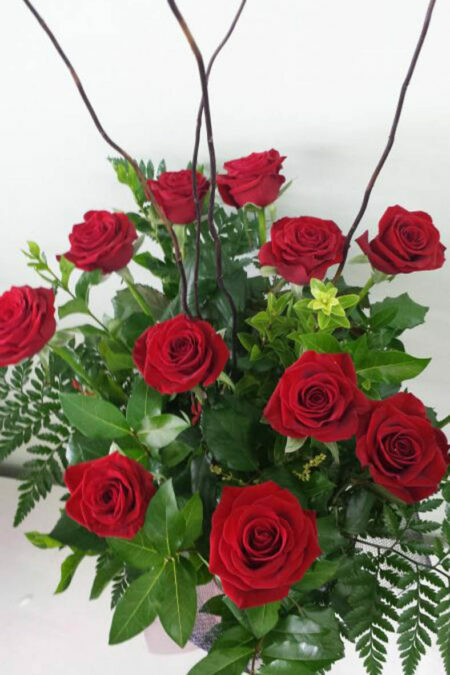 Roses are always a favourite and can be displayed in many ways. 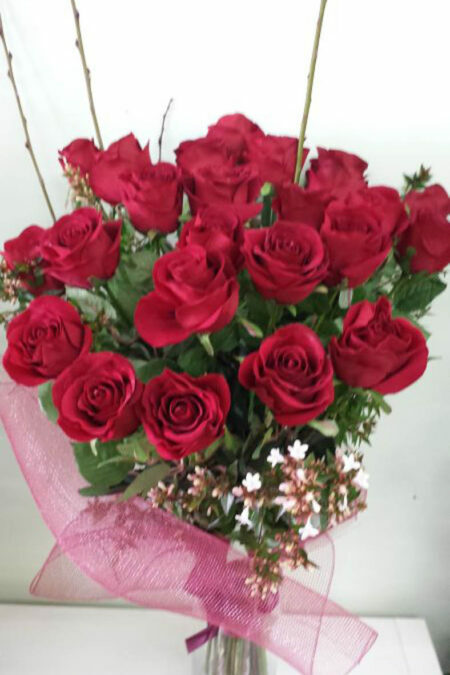 Roses look stunning arranged in a vase or nice ceramic pot with lush foliage. Red is traditionally the romantic colour choice for love but the other colours can mean friendship, innocence, forgiveness and even tranquillity and peace. 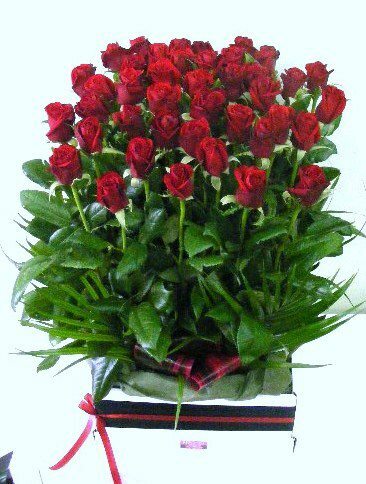 Valentine’s Day is the biggest celebration of love and the rose is the chosen flower. 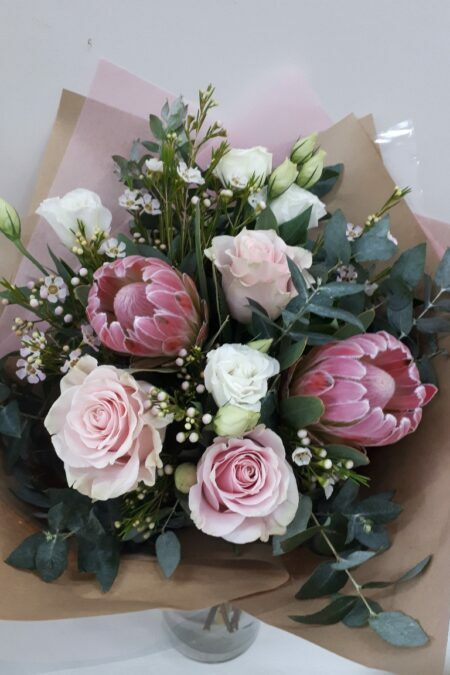 Our roses are sourced fresh daily from our selection of local market growers, with each flower hand-picked by the owner, so that only the freshest flowers are used in your arrangements. 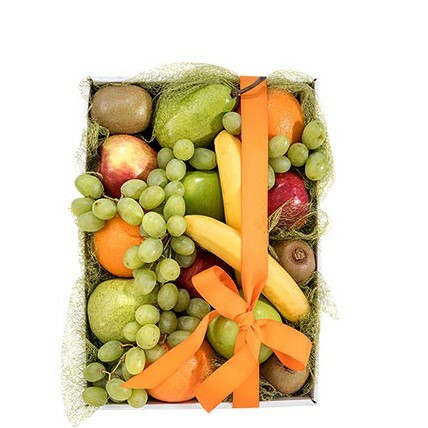 We also source the more exotic varieties for weddings and other special events. Looking for something different with that modern edge? Try our range of popular succulents and Kokedama, the new craze of Japanese string art that can create a stunning hanging living garden. 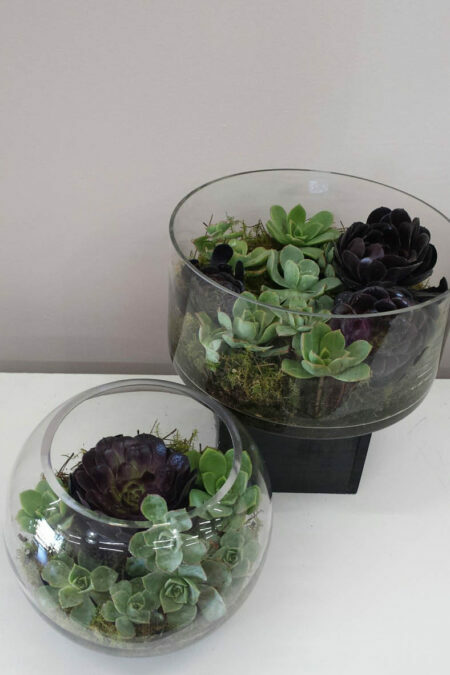 At Blackwood Florist we have a wide selection of fantastic fresh succulents, which come in a range of glass hanging vases, standing vases, glass fishbowls or glass jars. Succulents are a great idea for a long-lasting present, or to brighten up those spots around the house, and are very easy to maintain. A popular gift for someone with not a lot of space or time to continuously water and look after plants. 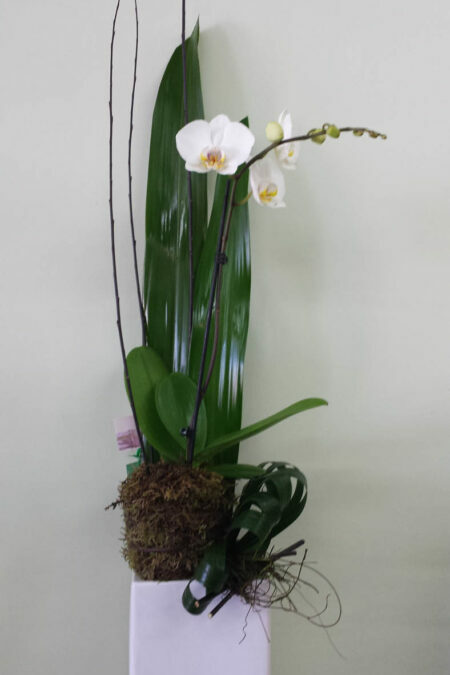 Or how about our range of Kokedama? 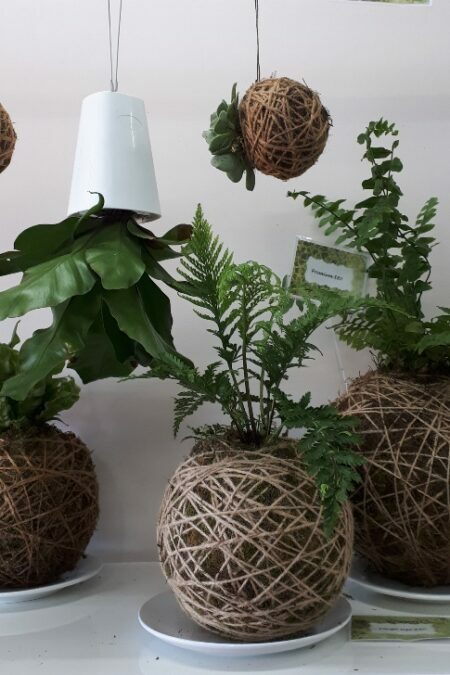 This stylish arrangement of plants in a covered moss ball continue to grow and expand and look amazing hanging around your home indoors or in a sheltered outdoor spot. They don’t require too much maintenance only a good soak of water weekly. They can also be placed on a decorative dish and displayed throughout the home or workplace. 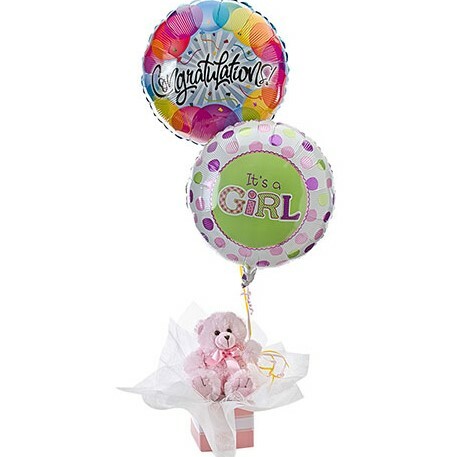 You can search by price, category, flower type or occasion, just to make it easier to find what you are looking for. You can also change the colour scheme to suit the occasion. If you can’t find exactly what you’re looking for, feel free to contact us and we can cater to your needs. Simply click the ‘Contact Us’ button at the top of the page. 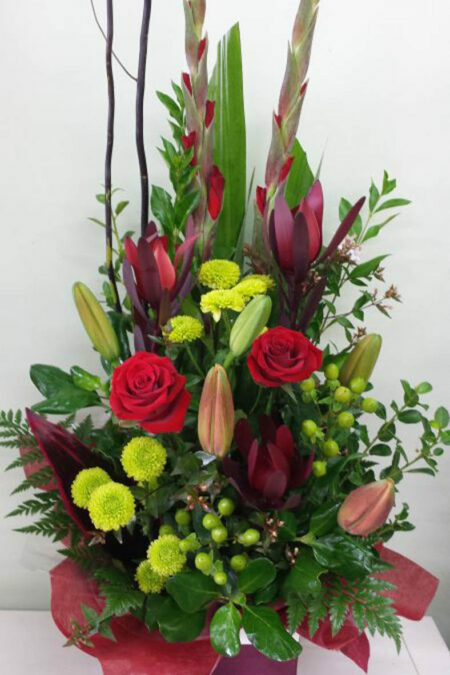 Blackwood Florist has always strived to maintain exceptional customer service and care in helping you select the right choice for any occasion. 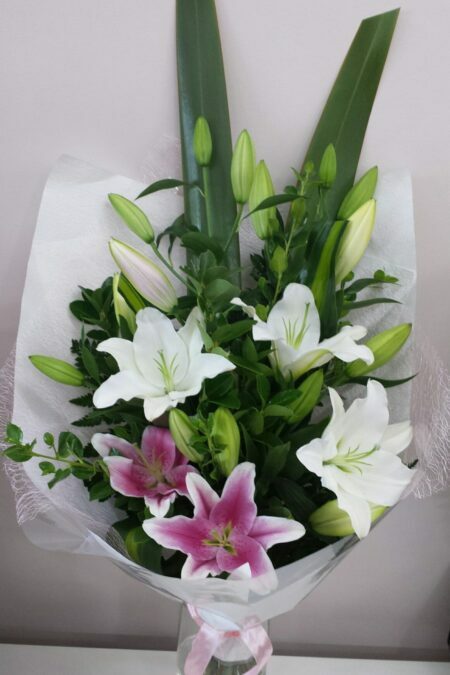 We are always happy to help in any way to make your experience in purchasing flowers and gift’s easy and satisfying.